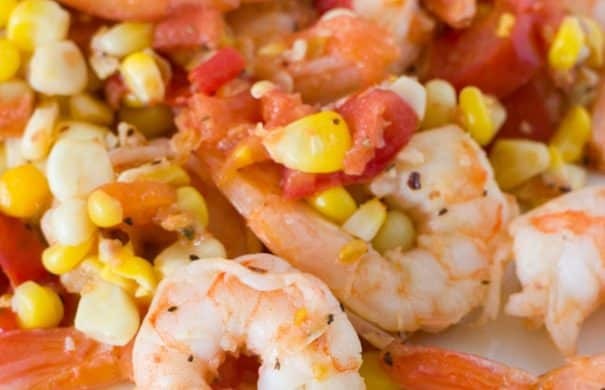 Easy to make Shrimp, Tomato & Corn Salad that is ready in 15 minutes. 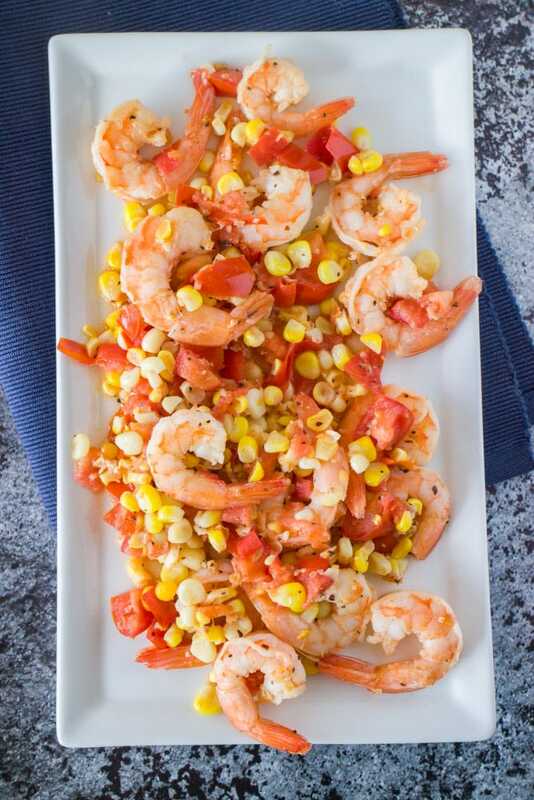 This is perfect to serve for dinner over pasta, as a appetizer or a light lunch. This is my current go to lunch as well as go to appetizer for dinner parties if I don’t have time to bake some homemade bread. 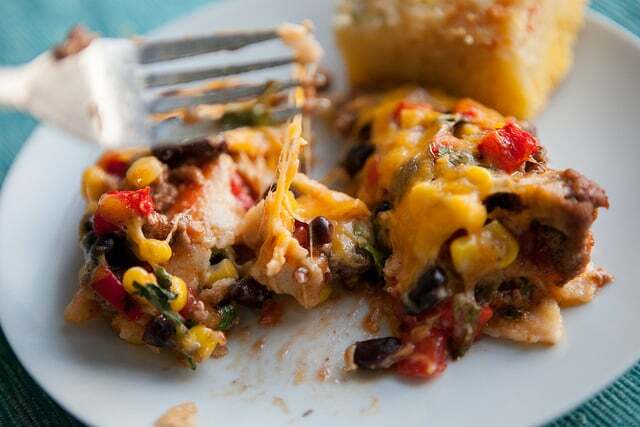 I love this dish because it’s easy to make, filled with healthy vegetables and is delicious. If I’m expecting a solo dinner, I can quarter this recipe and serve over some fettuccine noodles and it tastes like a gourmet meal. 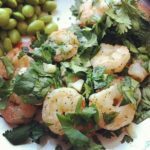 I love the taste of lime and cilantro to garnish a dish, but if lime isn’t your thing you could substitute lemon juice instead. 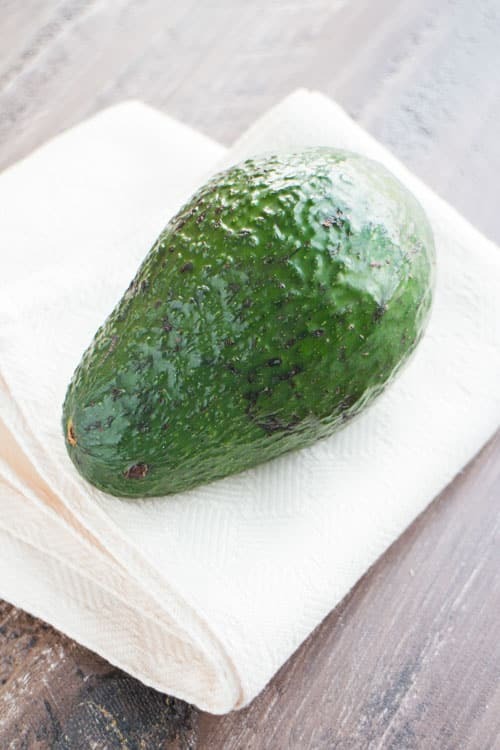 You could also turn this into a full salad and throw it on top of some crunchy arugula – another one of my favorite lunches! 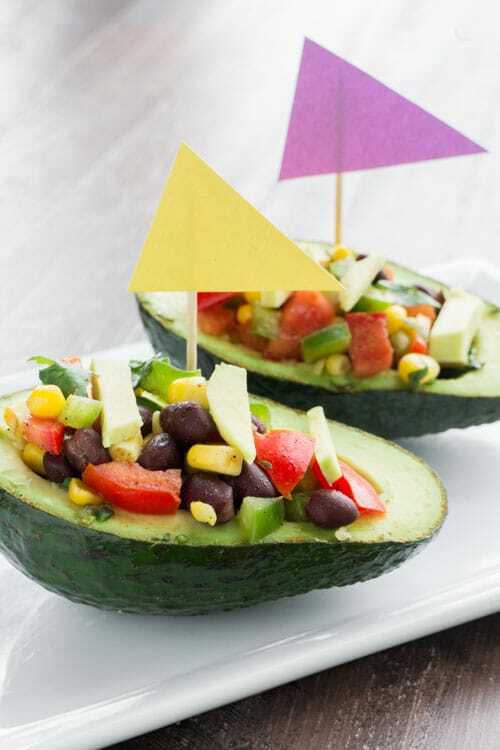 See, isn’t this salad awesome because it’s so flexible? Hope you enjoy! 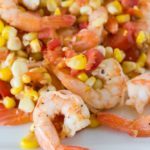 Easy Shrimp, Tomato & Corn Salad made in 15 minutes! 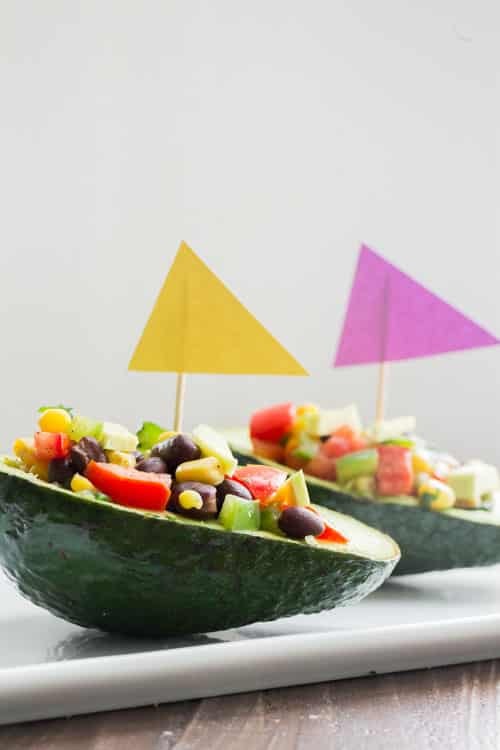 Perfect as a healthy salad or side dish! Add olive oil to a large skillet over medium high heat. 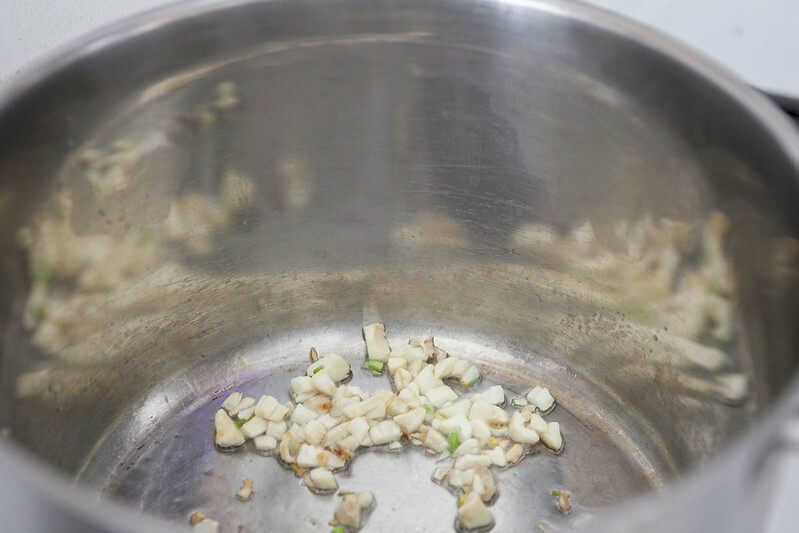 Add minced garlic and stir until fragrant, about 1 minute. 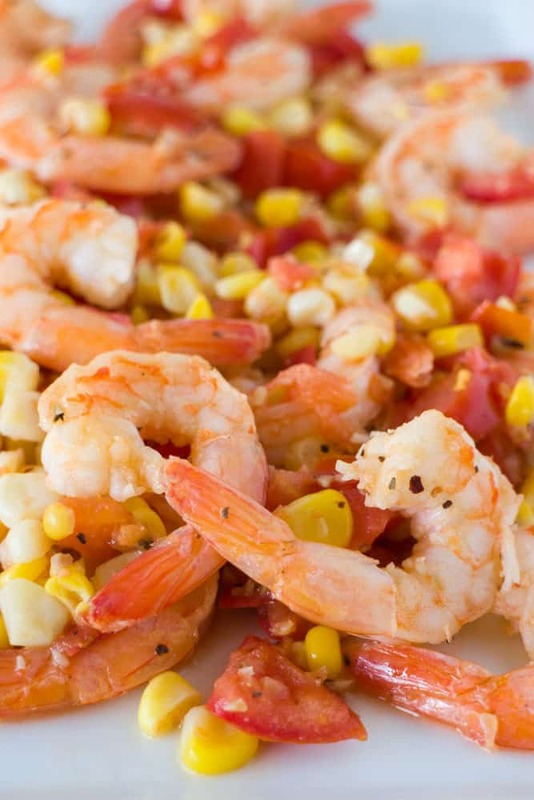 Add shrimp and tomatoes and continue to cook for about 4 minutes. 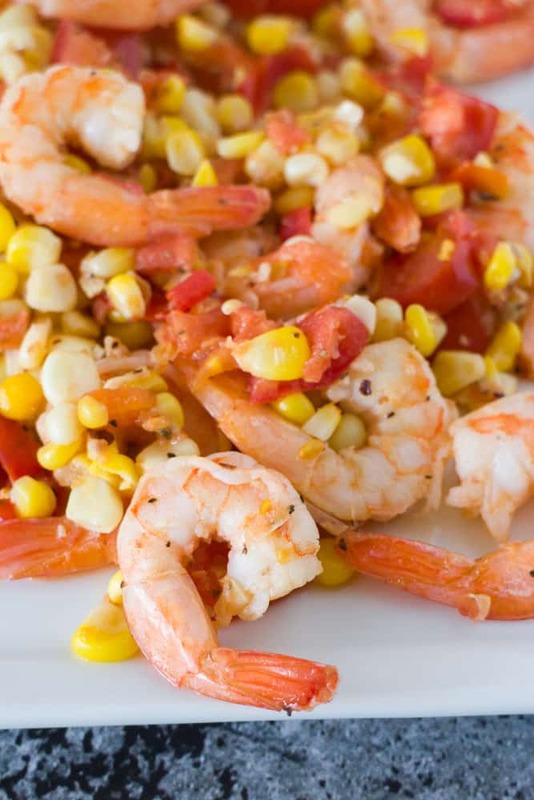 Add corn, salt + pepper to taste, a sprinkle of red pepper flakes and lime juice, stirring for 1 more minute. 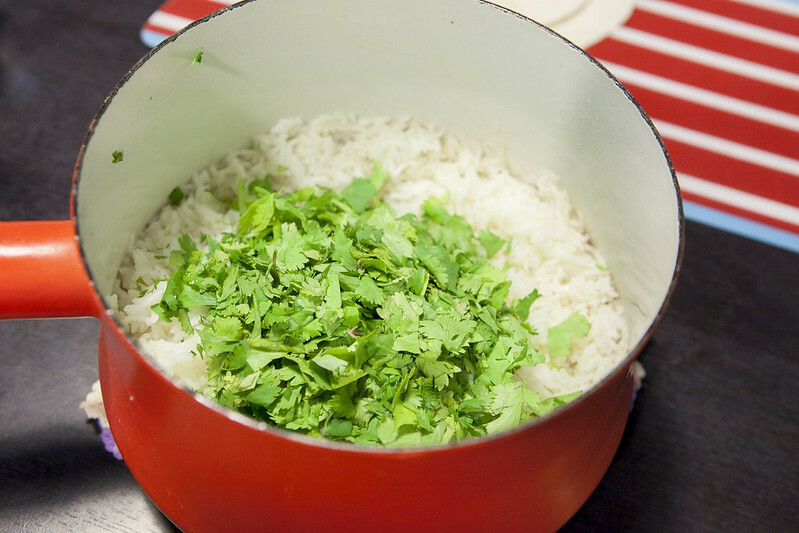 Sprinkle with cilantro and serve. 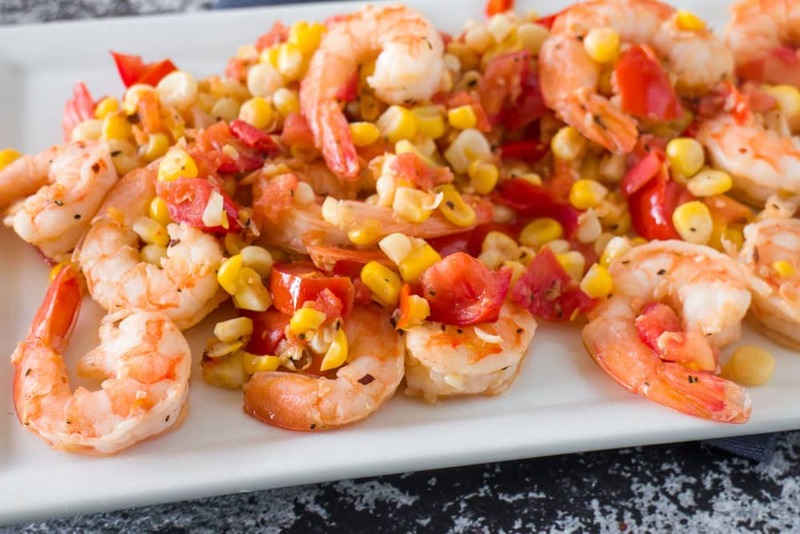 This makes a great dinner over pasta, a appetizer salad or a light lunch. 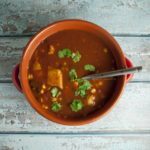 Slow Cooker Mexican Vegetarian Tomatillo Soup is a comforting recipe filled with healthy vegetables. 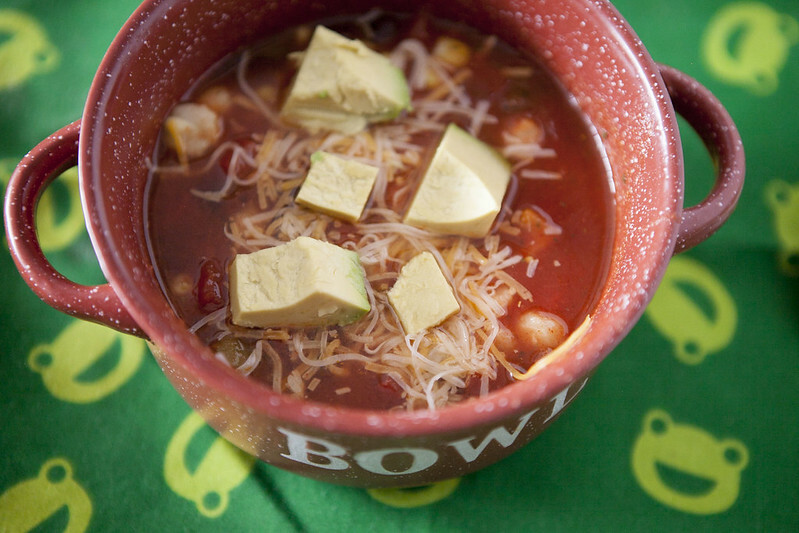 Unlike other Fall comfort soups this one is low calorie. 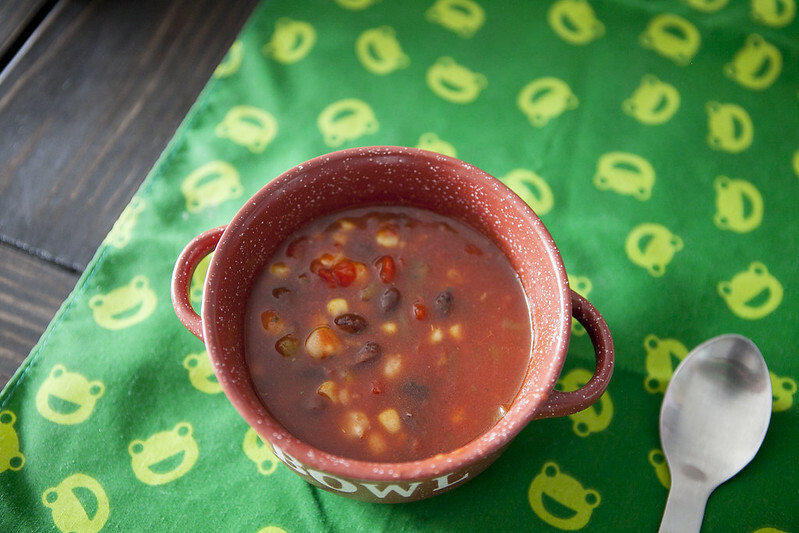 Soup ingredients include fresh tomatillos, tomatoes, onion, jalapeno, corn and black beans! 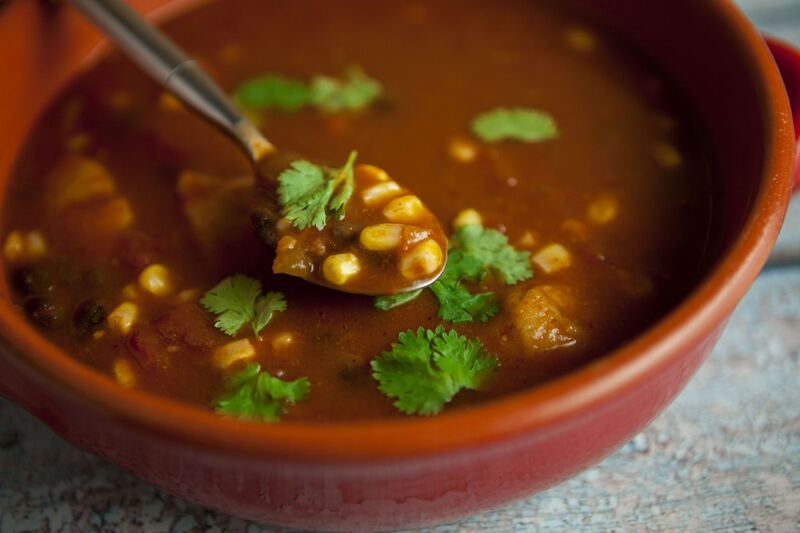 henever I think of tomatillos my mind always goes to soup so I decided to follow this path and come up with a Mexican inspired soup that uses tomatilos, as well as other garden fresh veggies: black beans, tomatoes, onion, jalapeno and corn. 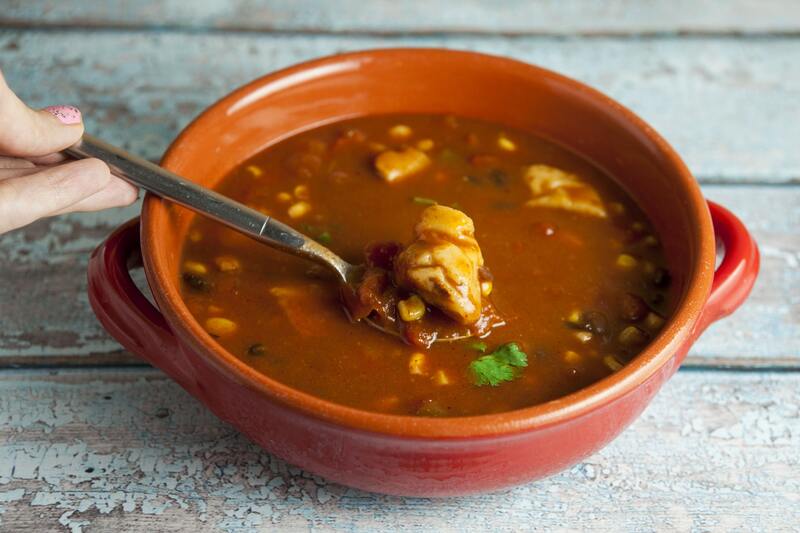 This tomatillo soup tastes delicious and has a deep flavor due to the vegetables and spices. It’s a comforting soup but doesn’t feel heavy like many other Fall soups. I suggest serving this alongside some rolls or biscuits for dipping. 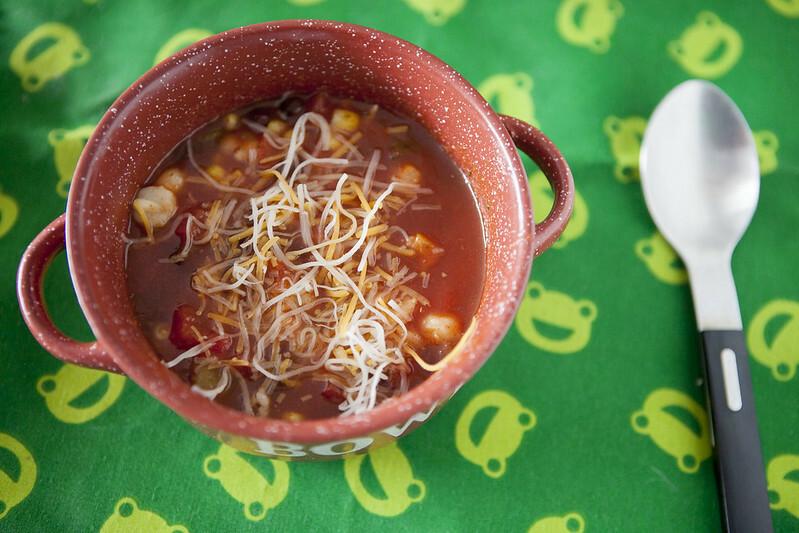 It warms my heart (literally) to see so many of the vegetables we grew in this soup. 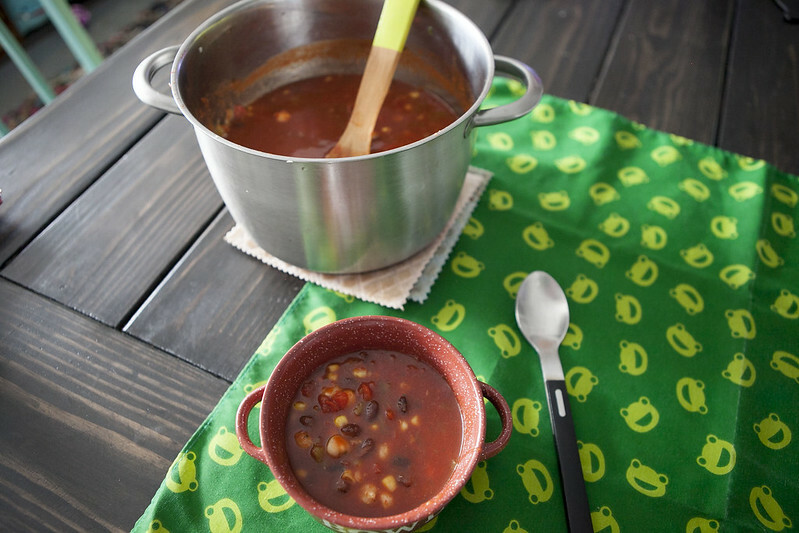 The stars of this soup are the tomatillos which are filled with tasty juices that are going to be released in the slow cooker. 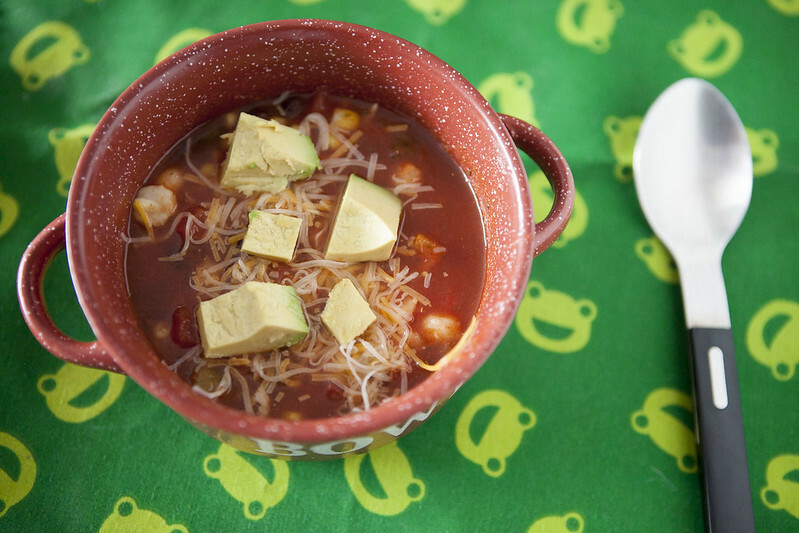 The other personal star in this soup are the black beans. Last year we started growing our own dry beans and since then I’ve been hooked. 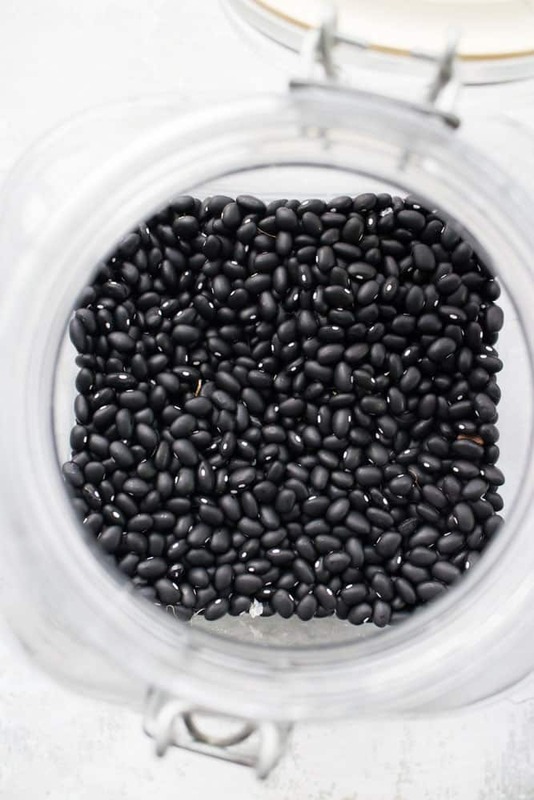 We grow a few different dry beans during the Summer so we can enjoy them in the Fall and Winter. 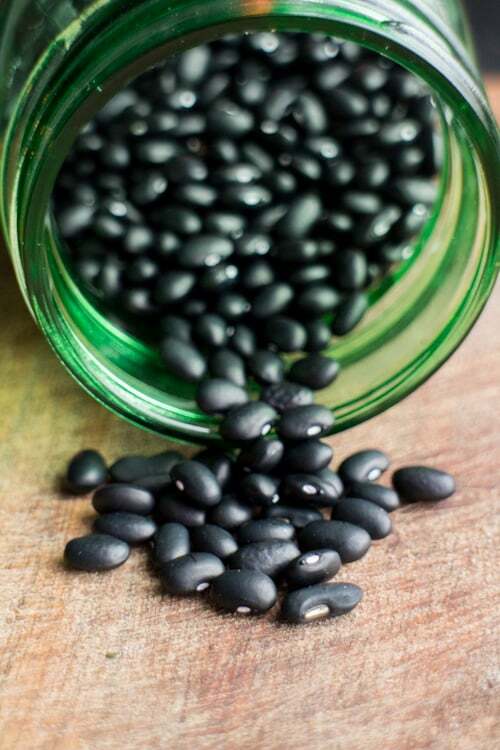 This recipe calls for 1 cup dry black beans but if you don’t have the time to soak them you can also use 1 can of black beans. 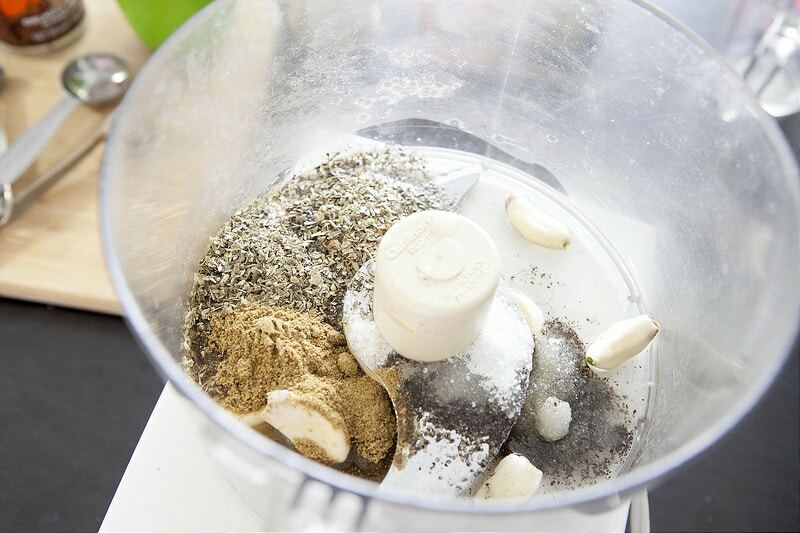 In my opinion cumin is always a good addition! 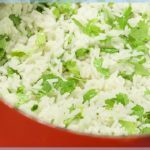 Enjoy this rice salad! 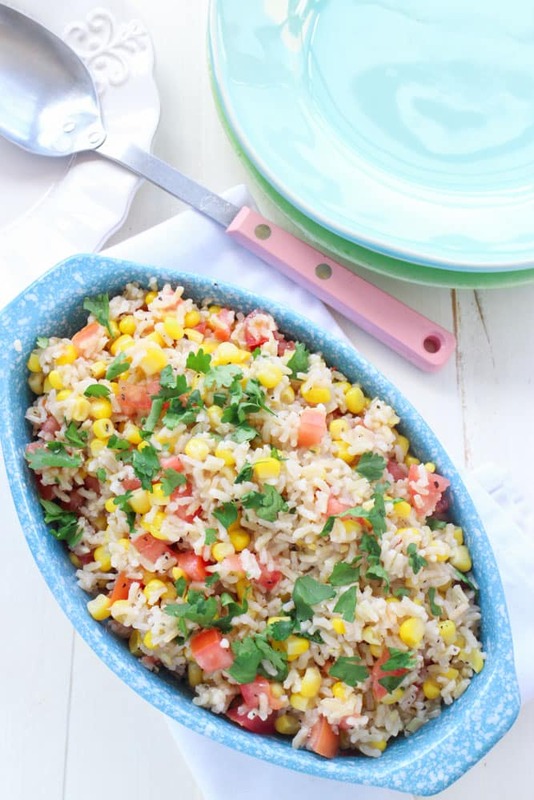 This Corn and Tomato Rice Salad is a healthy recipe for dinner, picnics and potlucks. 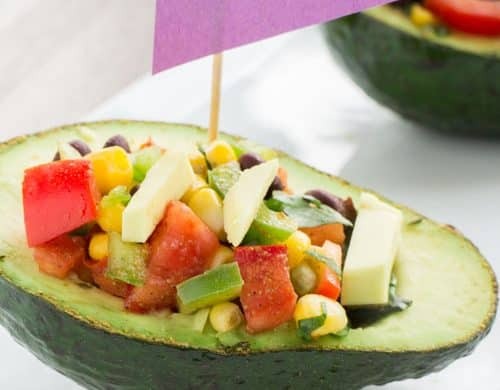 With it’s Mexican inspired flavor it’ll be a hit with everyone! 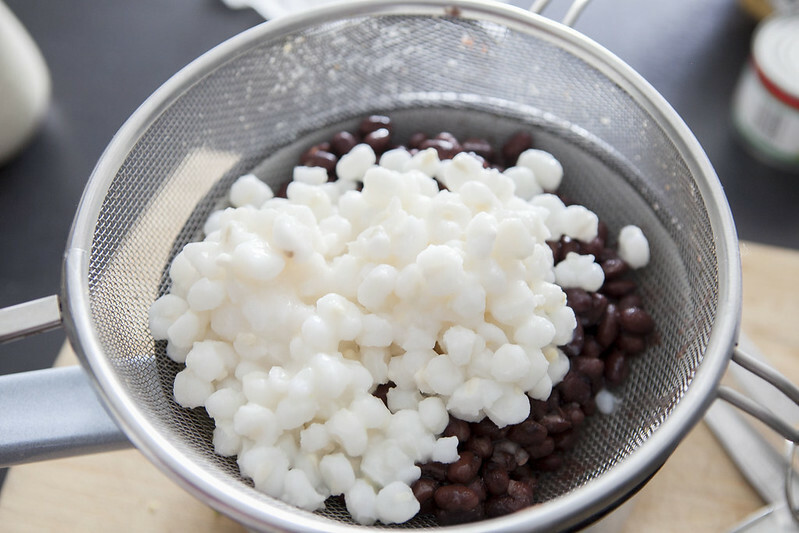 And even better, it’s easy to make in 15 minutes! 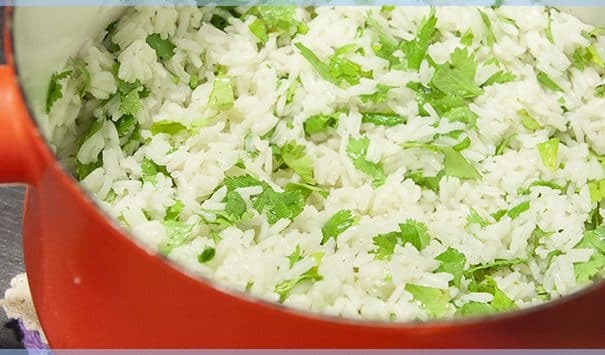 I’m in love with this rice salad. 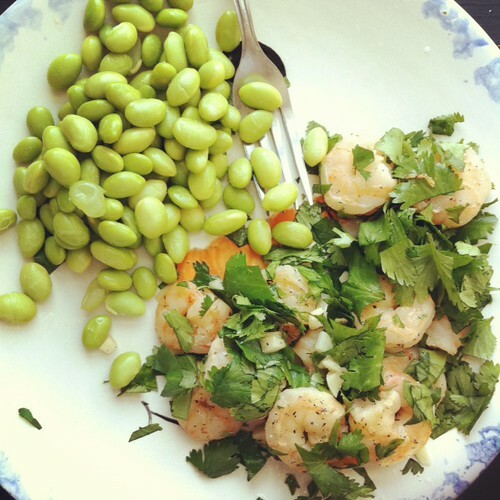 I took a version of this recipe to a potluck last week and I’m proud to say it was the first dish that was empty. 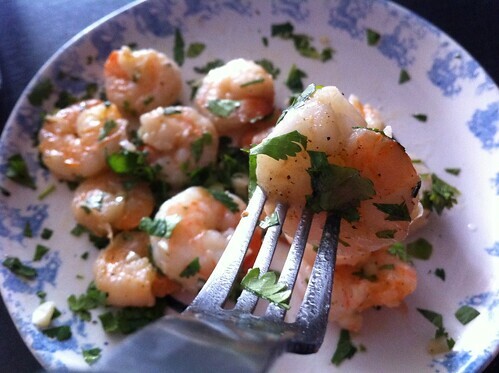 This is a great fresh ingredient recipe that lightens up dinner. 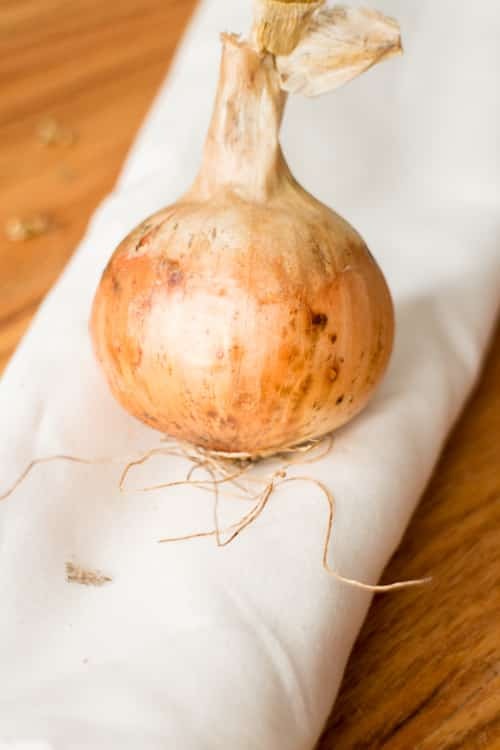 You can serve it as a side dish or a main dish, preferably served alongside some fresh bread. 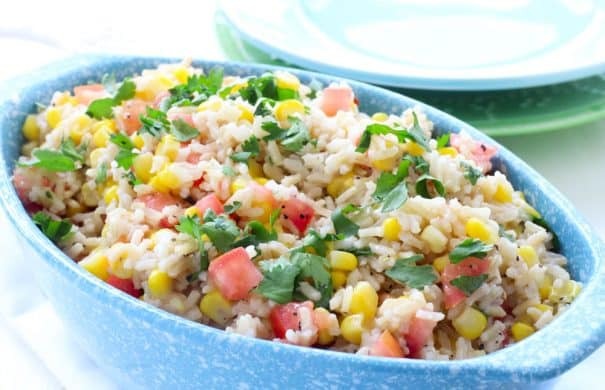 What I especially love about it is that due to the lime juice, crushed red pepper flakes and cilantro it has a Mexican flavor added to it. 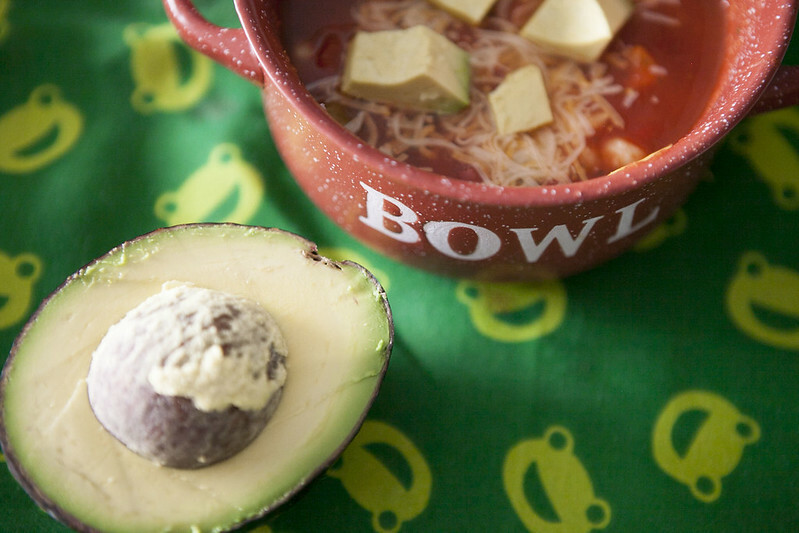 Anyone else love Mexican flavored everything? 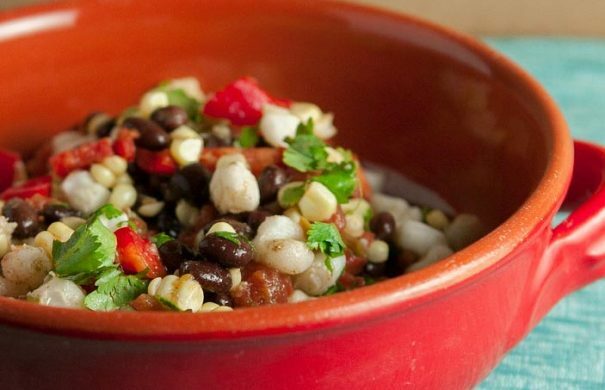 This salad is so good you could even fill up a burrito with it and call it dinner. 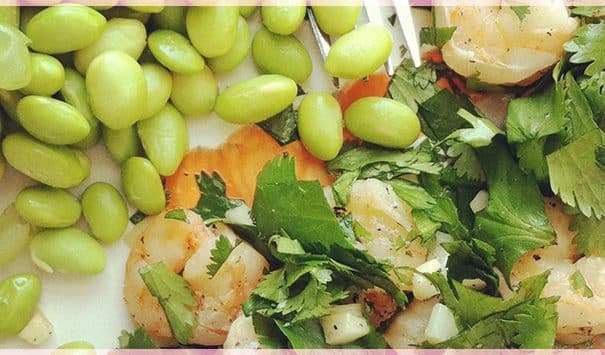 And because I love fresh recipes that are quick to make, this salad is ready to serve in 15 minutes. 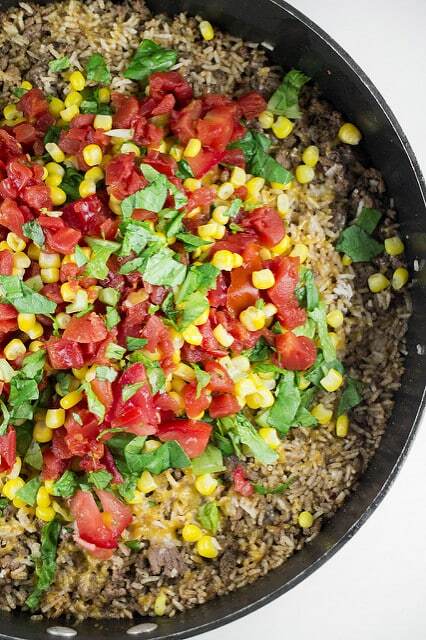 The main ingredient is Minute® Whole Grain Brown Rice so you’ll have great-tasting fluffy rice in just 10 minutes. 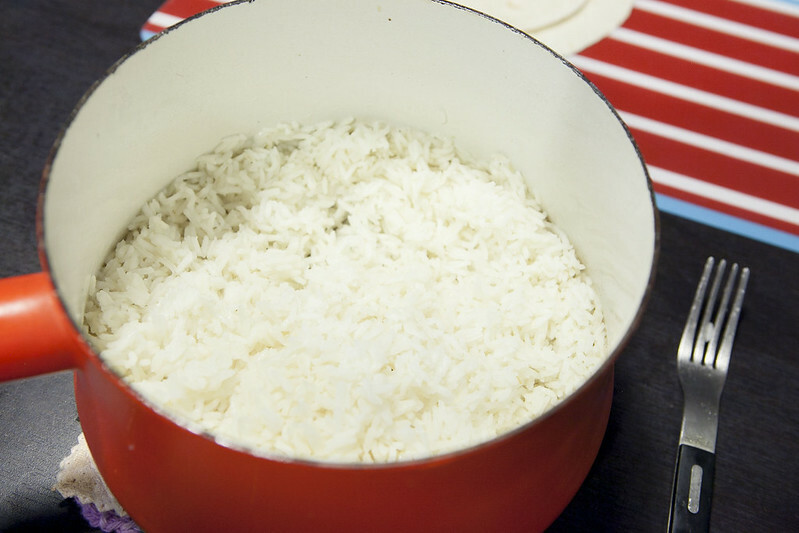 Brown Rice is a nutritious option as it has similar nutritional values to regular long cooking brown rice, but it’s done in 1/4 the time. 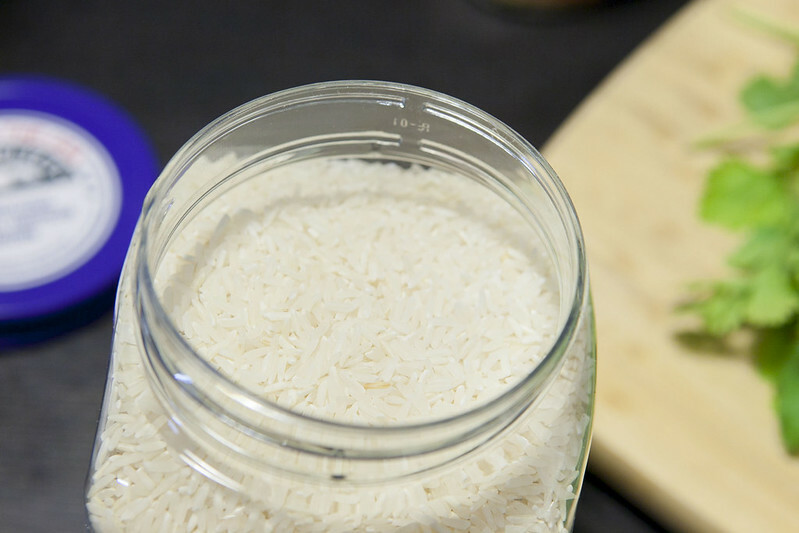 I love brown rice because of it’s versatility – you can use in cheesy casseroles or light lunch options. 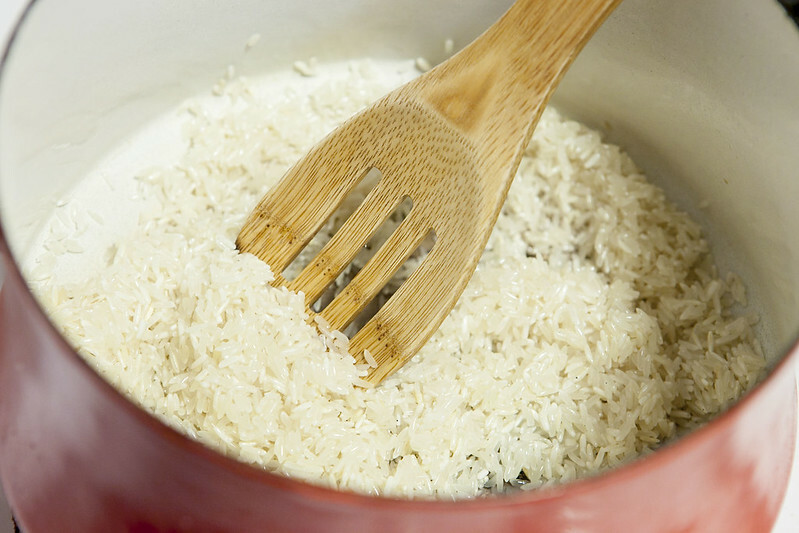 One tip to get the tastiest brown rice is instead of boiling in water, try vegetable broth. 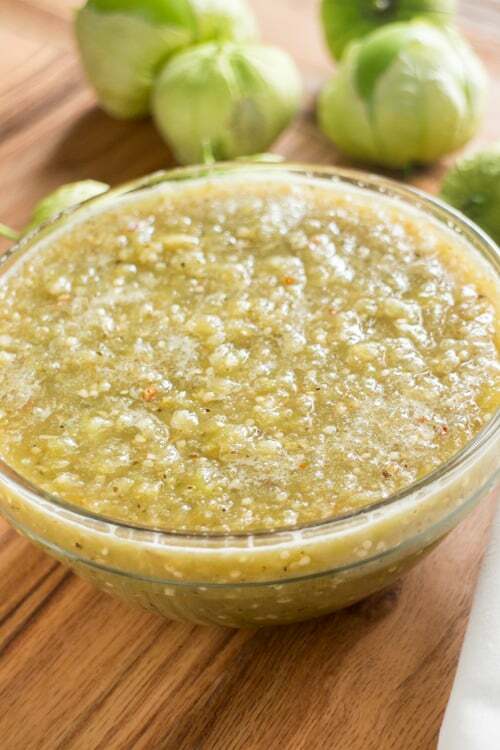 The BEST Tomatillo Salsa recipe using fresh tomatillos and onions. 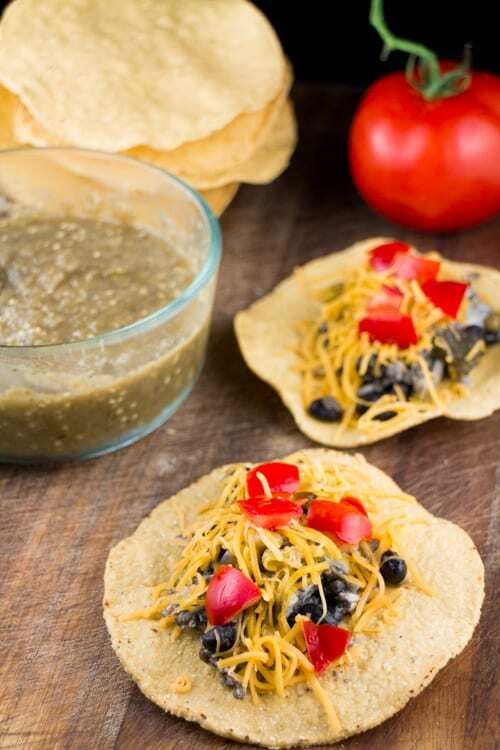 My family loves this easy to make salsa served with tortilla chips! 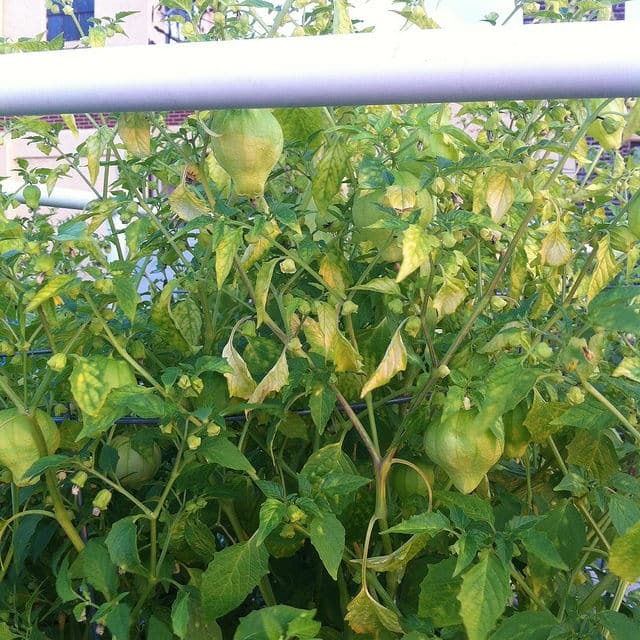 This was the first year trying to grow tomatillos and it was a great big experiment. I was buying a bottle of Salsa Verde almost once a month and then I got Matthew hooked on it too. Then I decided we must grow our own. 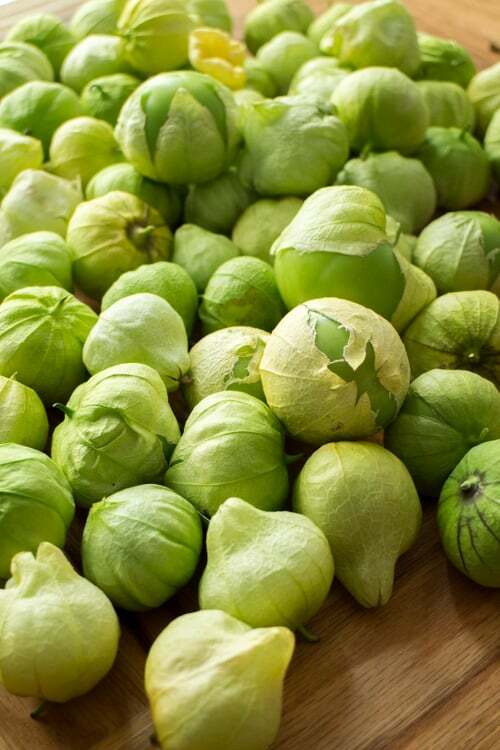 So let’s grow some tomatillos. 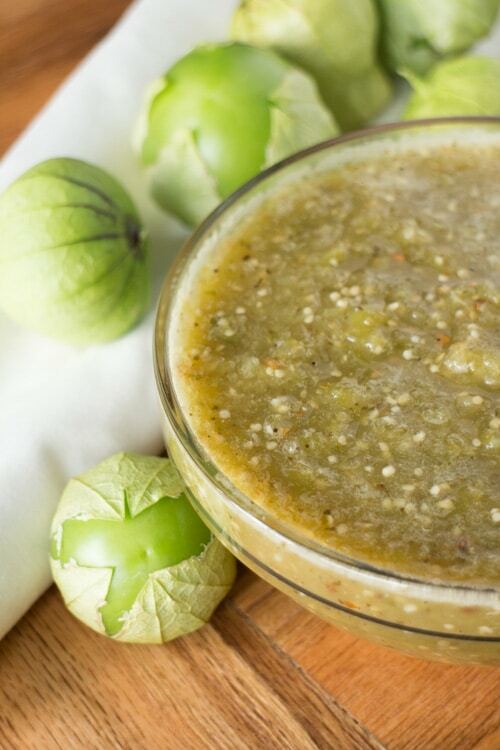 Tomatillos are a plant of the nightshade family and are related to the gooseberry. They are small, green and grown with a paper like husk around each of them. 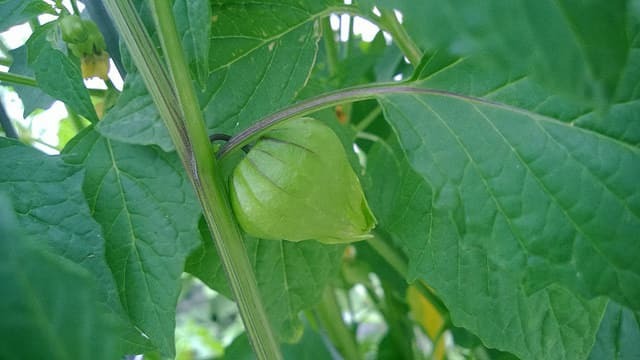 When growing them first the husk will grow to it’s full size, and then the tomatillo itself will grow next filling the husk. 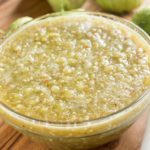 When the tomatillo fills the husk completely then you know they are ready to be picked. 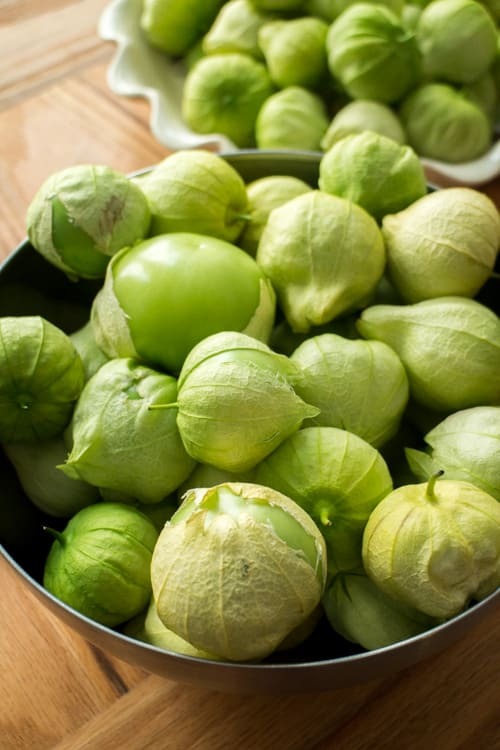 Once you bring them into your kitchen, then you peel off the husks and give them a good warm wash as tomatillos are naturally very(!) sticky. 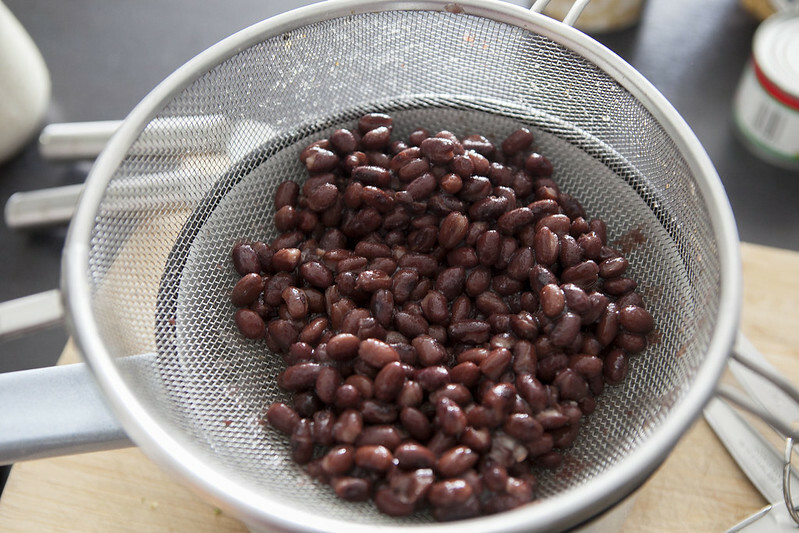 From there you can use them in various recipes, freeze or can for later usage. This year we got some tomatillo seeds and decided to give it a shot. We were pretty unfamiliar with how they would grow, or even what they would look. The season started out a bit rough. Hardly any of our seeds came up when planted inside and we thought it was going to be a bust or only have 1 plant. 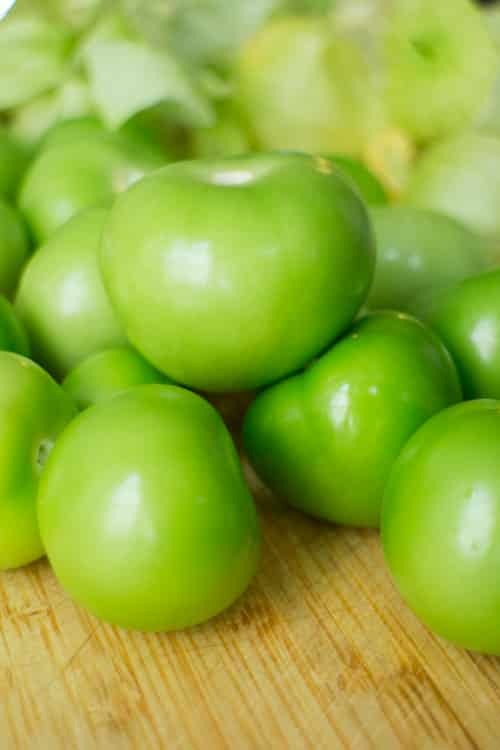 Having a single plant isn’t the best as most tomatillos need 2 plants to grow successfully for pollination. After hardly any seeds came up, then we planted a few more (also a bust) then a few more. I’m not one to easily give up when it comes to vegetables! We transplanted our single seedling outside in the container and then a few weeks later transplanted a few more once we finally got some actions from the seeds. 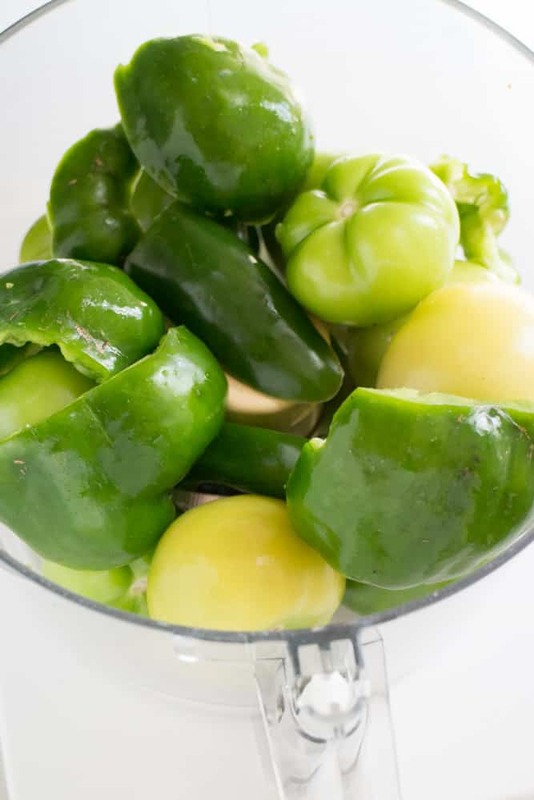 The tomatillos grew in large size containers and 5 gallon buckets. Right away we realized we underestimated the size and power of tomatillo plants. Here we were double caging the tomatoes to prepare for their height when we should have been getting ready for the incredible growth of the tomatillos instead! These plants grow tall and bushy. 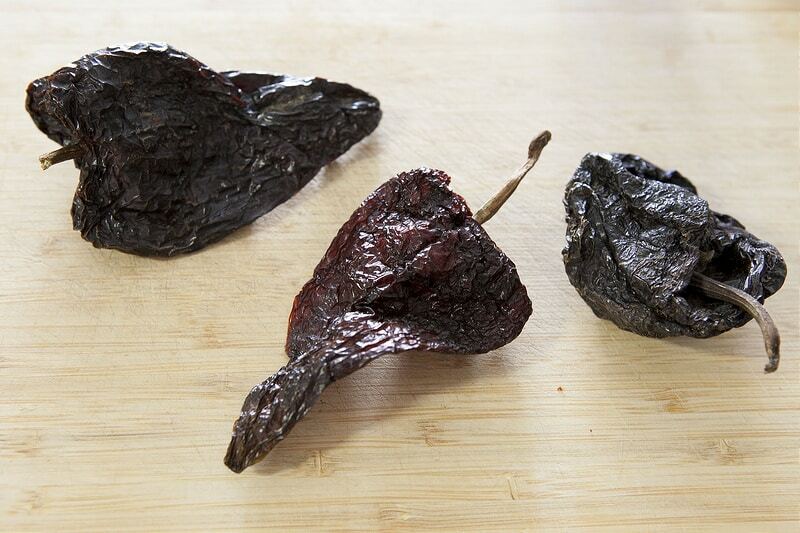 They are also extremely hearty and have very strong stems. You can see the tomatillo plants to the left and in the back. When the plant started growing we were both surprised (and quite happily startled) by the amount of flowers on a tomatillo plant. Almost every single one of these flowers would turn into a tomatillo! Bees were buzzing happily around these plants pollinating. 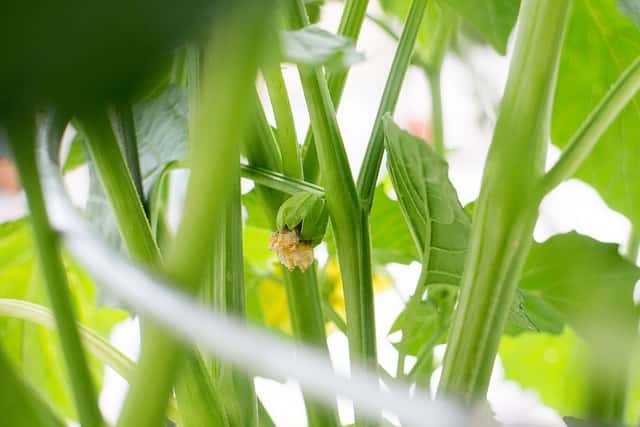 Here, the first tomatillo is spotted. Which then turns into a full size husk. Eventually this will fill up with the tomatillo inside of it. 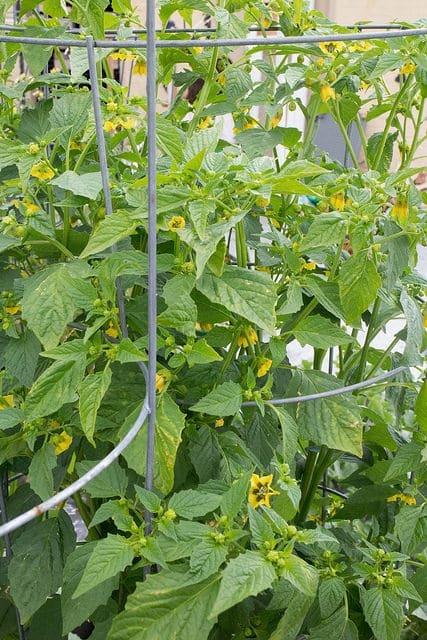 And then your plants will become taking off and you’ll have tomatillos all over! 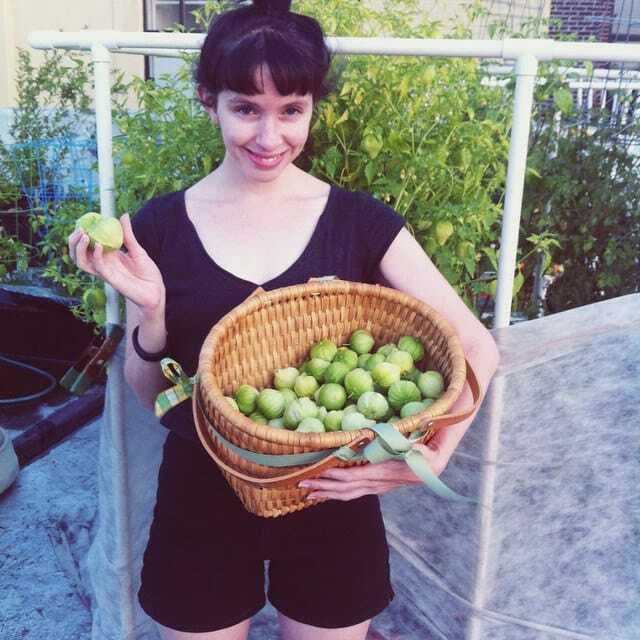 This was the first harvest of the tomatillos. I’m pretty happy here! 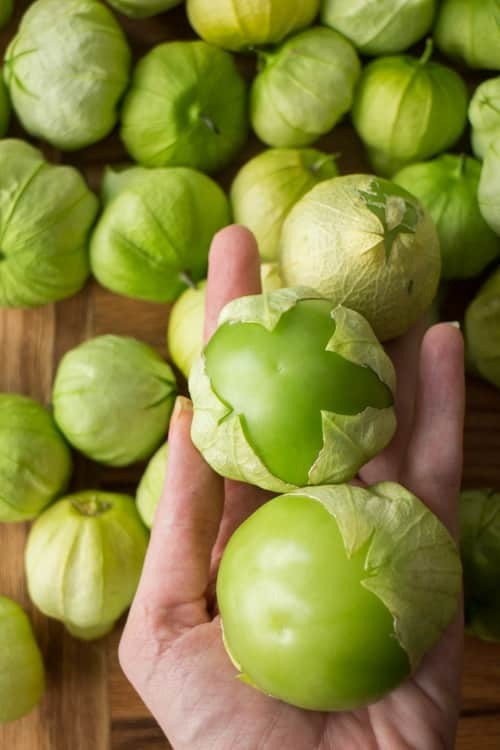 Tomatillos tend to blend in with the plant itself, so finding them basically consists of rooting around in the plant and gently squeezing each husk to see if the tomatillo is full inside. If it is, then pinch it off and throw it in your basket. This here is a few pounds of tomatillos with many many more pounds to pick! 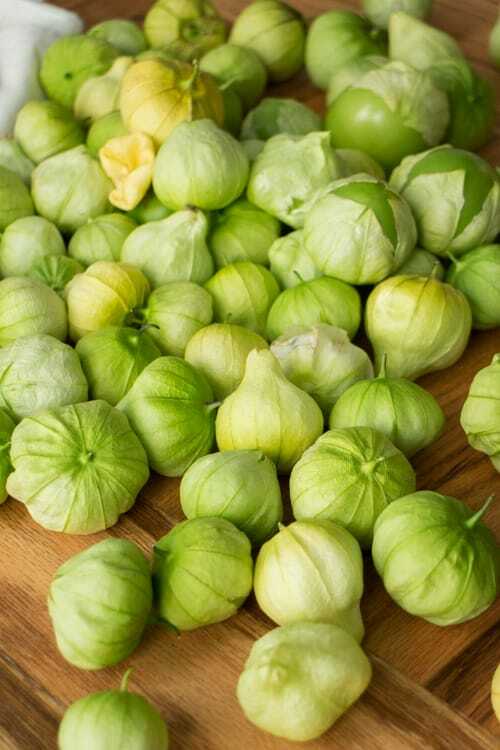 From seeds that didn’t come up originally to plants that are now battling for the largest yield of the season these tomatillos have come a long way! They’ll be a permanent fixture in the garden now! 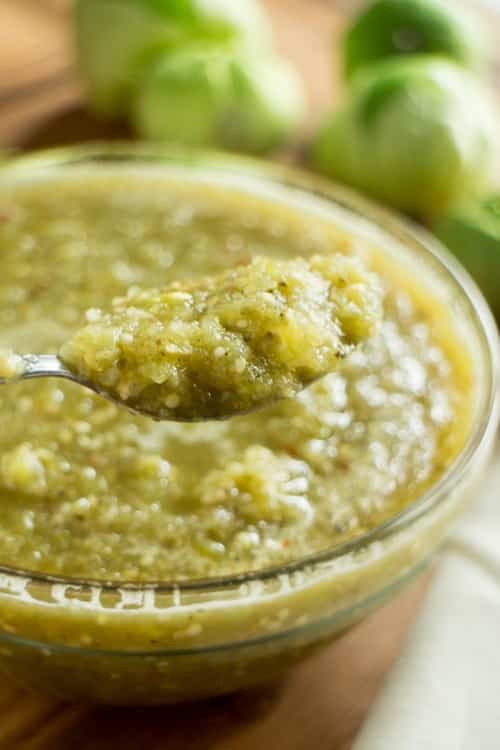 So with all these tomatillos what’s a girl to do besides make Salsa Verde right away? 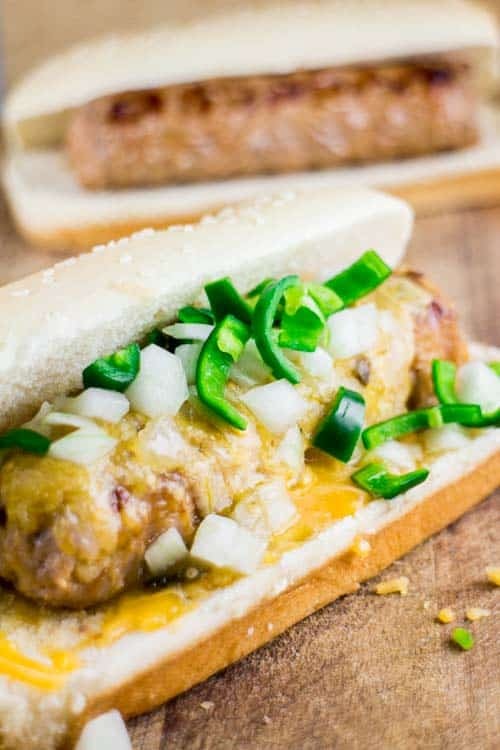 I created this recipe based off many of the backs of bottles ingredient lists that I read over the years of my favorite sauces I buy in store, but keeping it all natural. 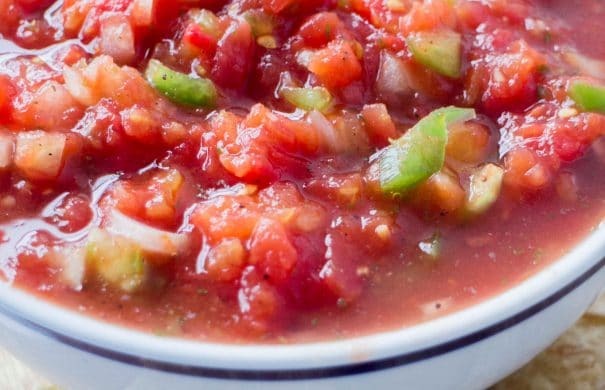 This salsa is incredibly easy to make and you won’t believe how much it tastes like your favorite brand. 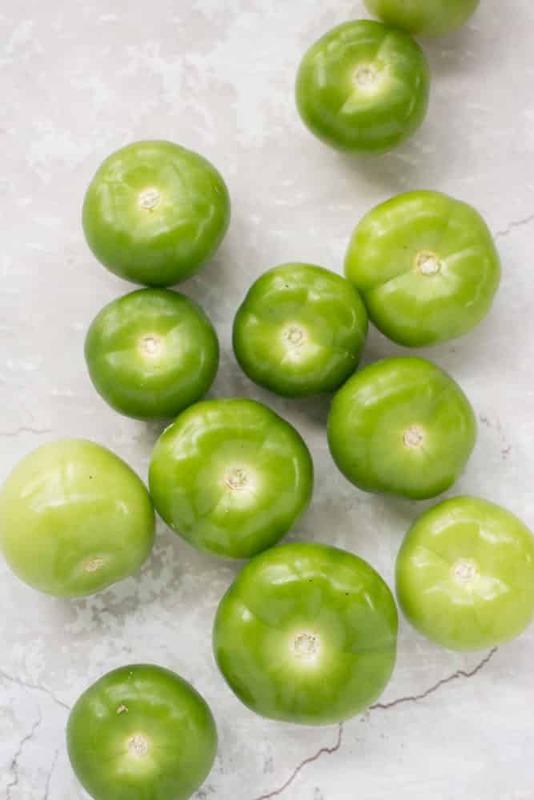 It’s really amazing to learn how much flavor a tomatillo has in it’s tiny size! 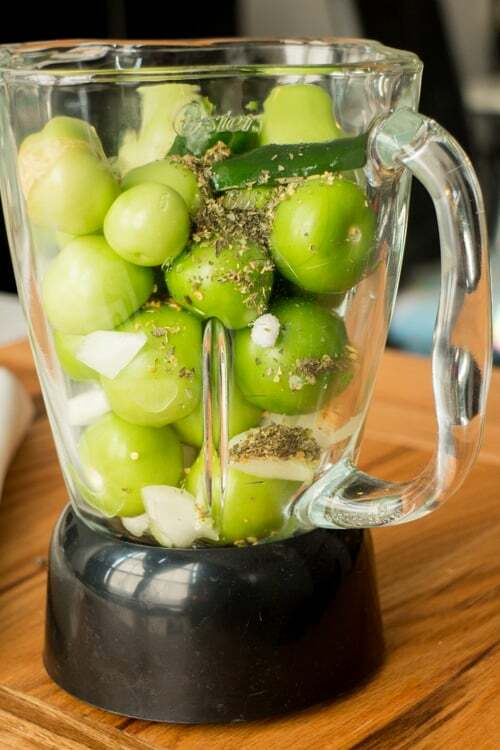 Your 2 main ingredients in this recipe are tomatillos and a onion. The rest of the ingredients are spices. 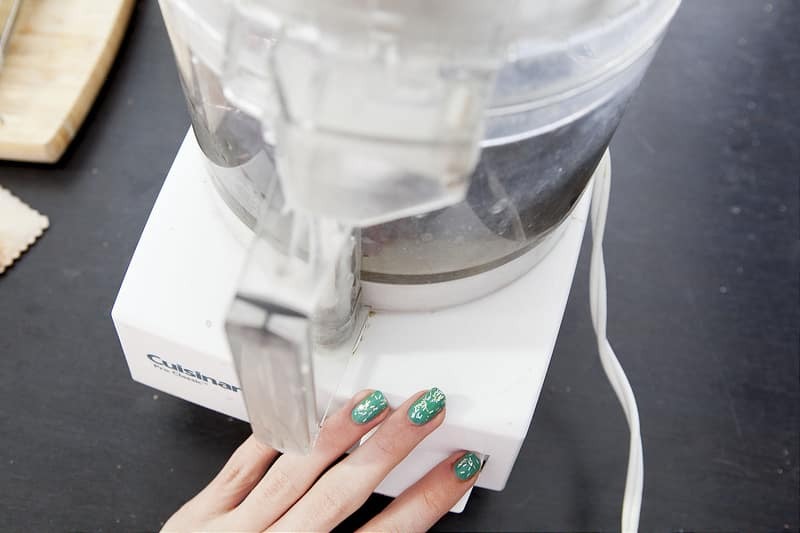 We’re going to blend them first instead of blending them later. Why? 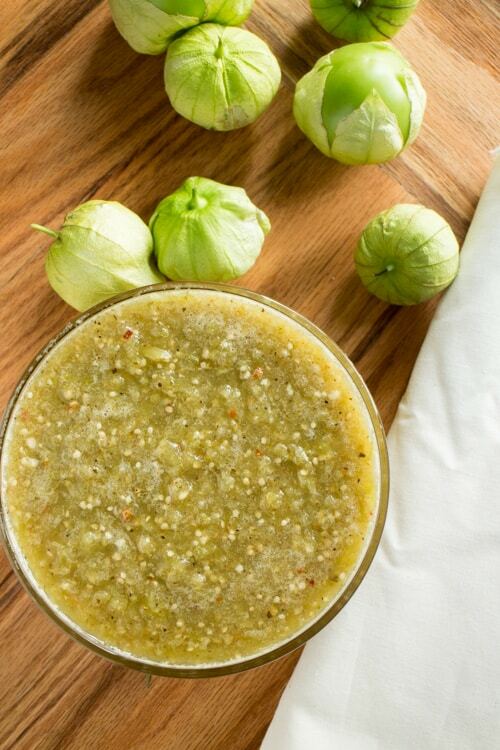 Tomatillos are juicy inside which means you don’t need to add much water to the recipe itself. 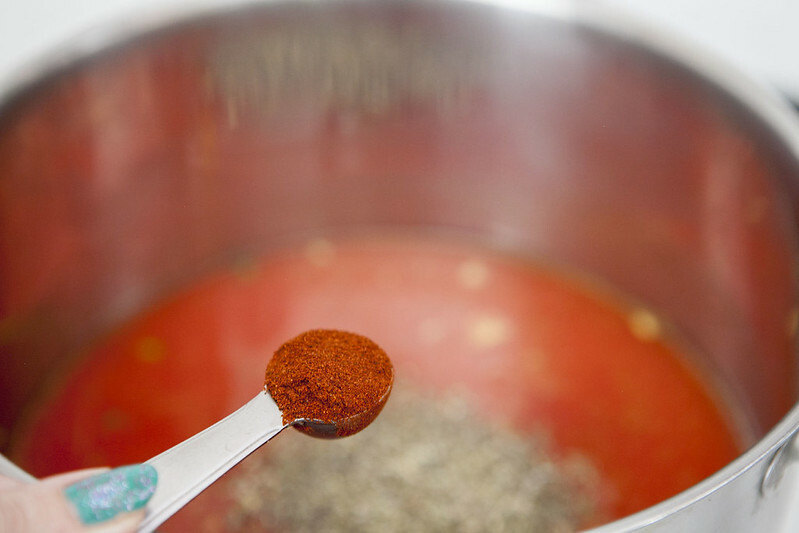 If you blend them after the fact, then you need to add water to simmer on the stove which means you’re watering down the recipe. 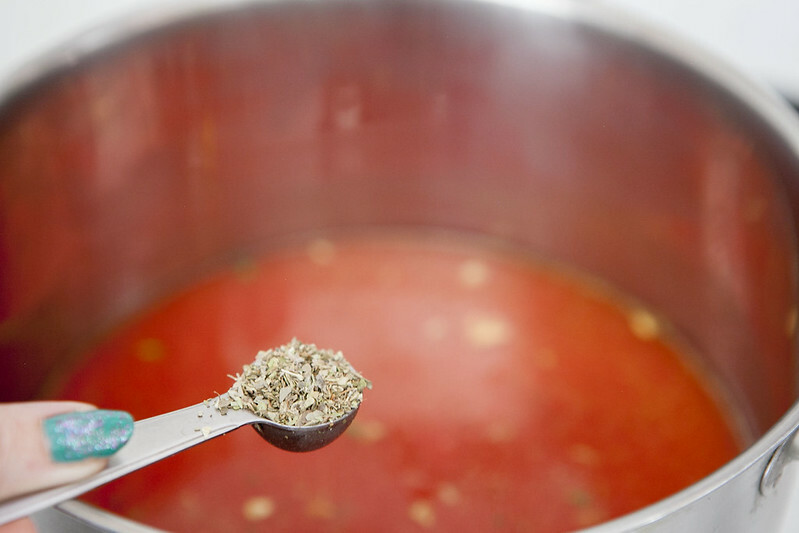 By blending them first we are providing them their natural juices to make it much more full of flavor instead of added water that isn’t needed. 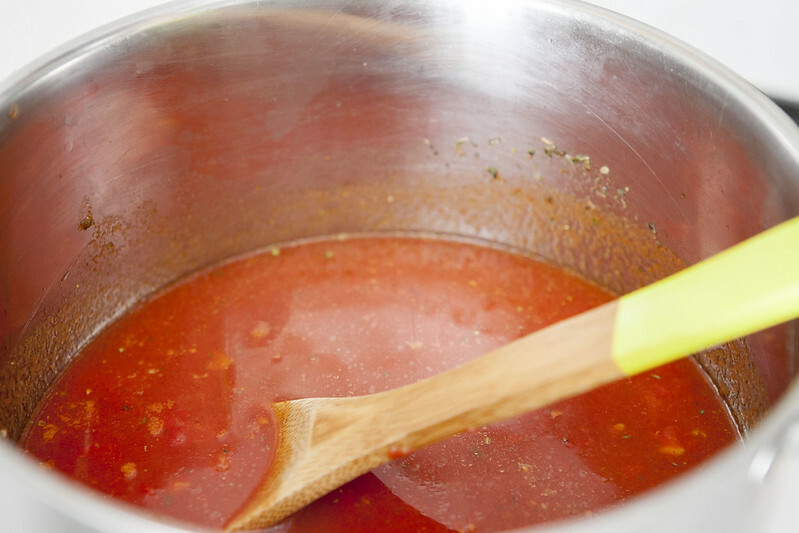 Then after a few seconds in the blender and 15 minutes on the stove, you’ll have some delicious (and amazing smelling!) 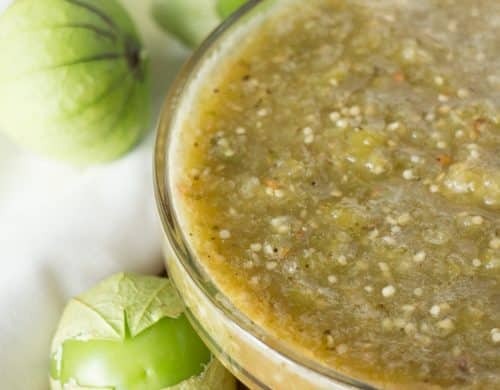 Salsa Verde! Did I take a spoonful of this and eat it right away? Yes, I did! 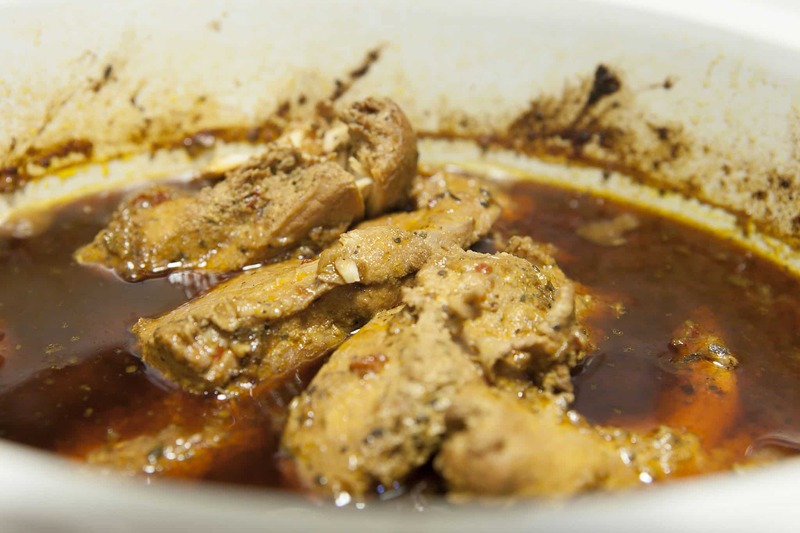 What can you do with this recipe? 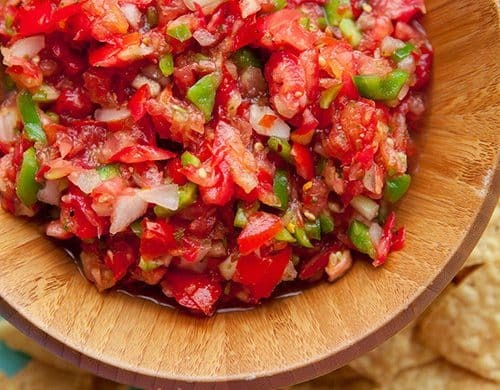 Well first you can use it as a salsa for chips, it’s incredibly delicious that way. 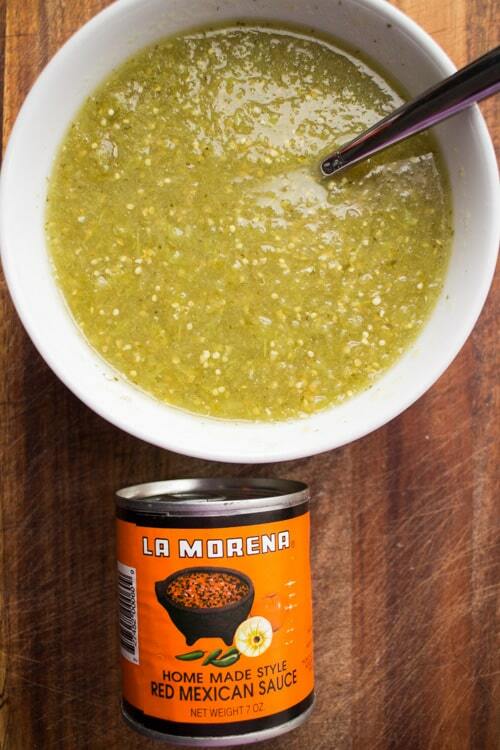 I love to cook with it though and it’s the perfect sauce to pour over cheesy enchiladas and tacos. 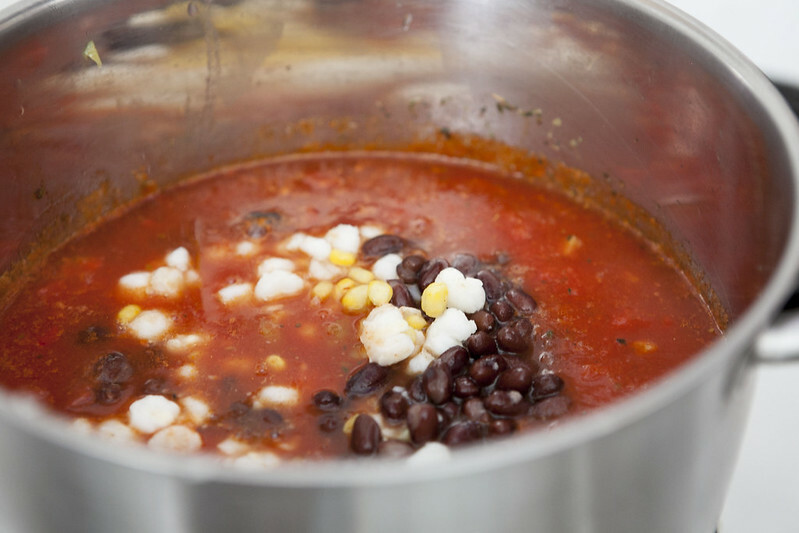 It also makes a great companion to creating a Mexican tasting broth for soup. 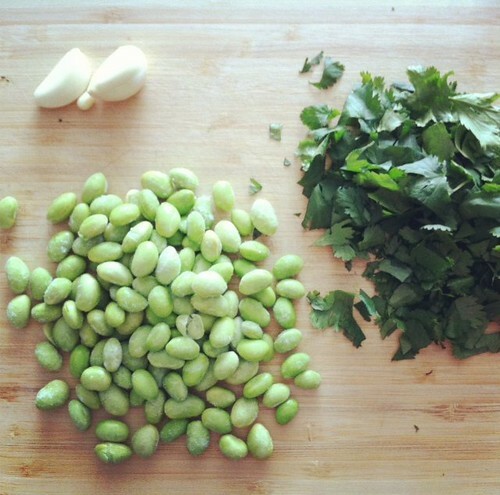 Only a pound of these tomatillos are going to make 4 cups of sauce. 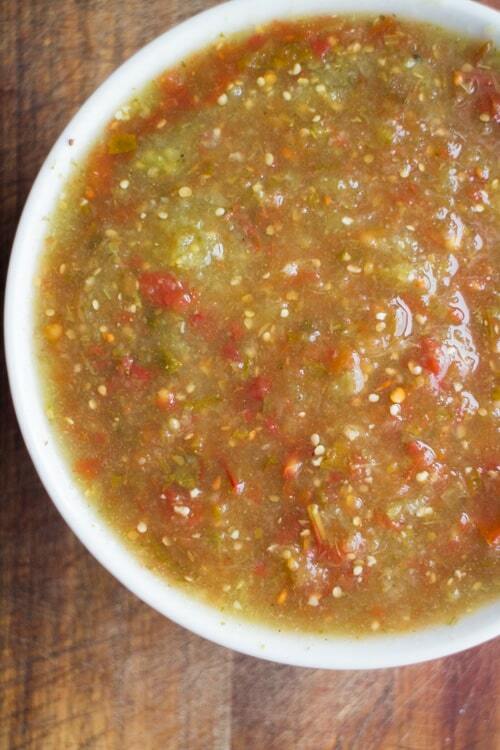 I often make a few batches of this Salsa to both eat fresh, store in the refrigerator for a few days or to freeze. 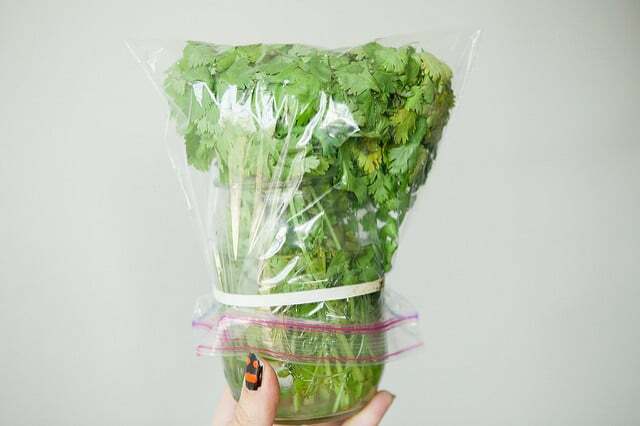 To freeze just pour into a freezer bag and put in freezer. 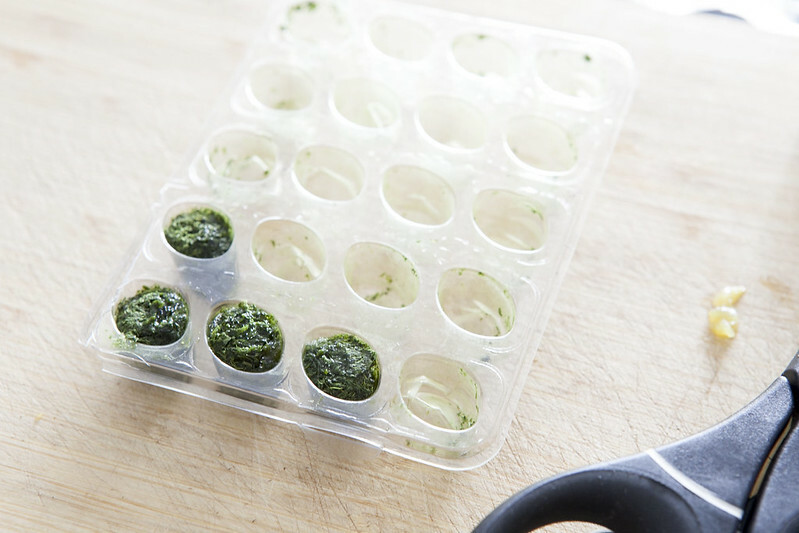 I like to store 1 cup servings in freezer bags as it makes it easier to grab a cup and use in a recipe. 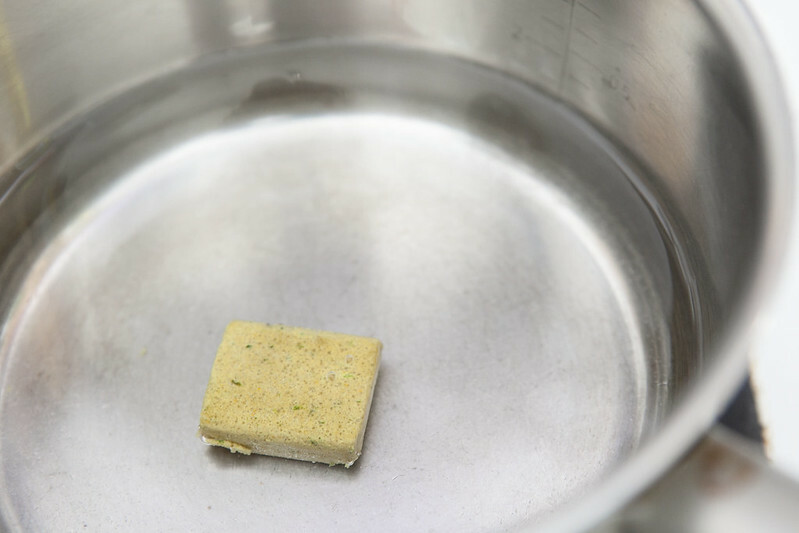 Place all ingredients except bouillon cube in a blender. 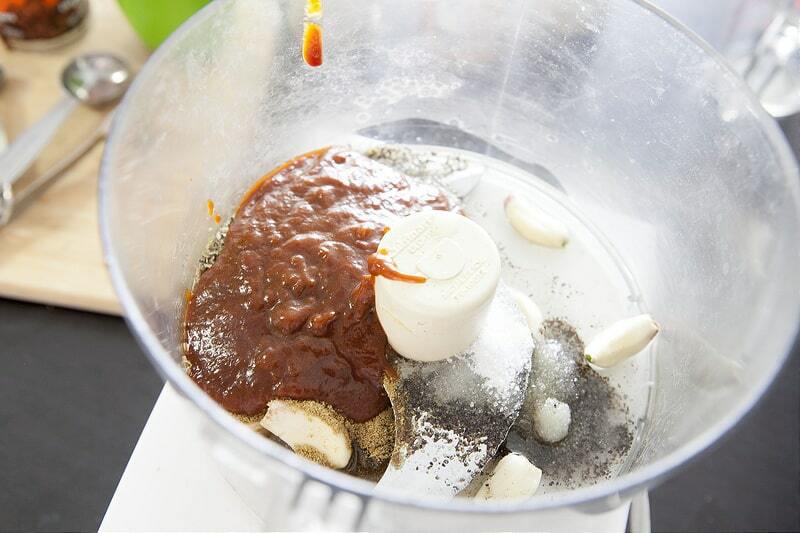 Blend until everything is combined and is salsa consistency. 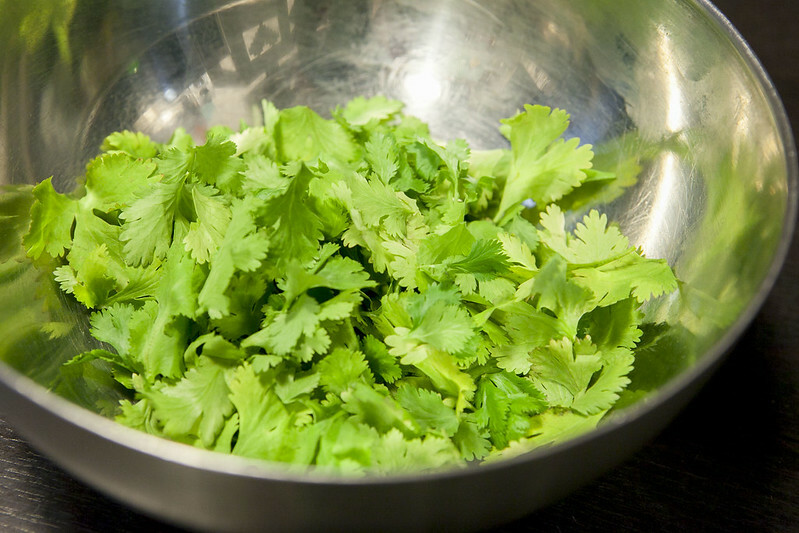 Add bouillon cube and stir into salsa verde. 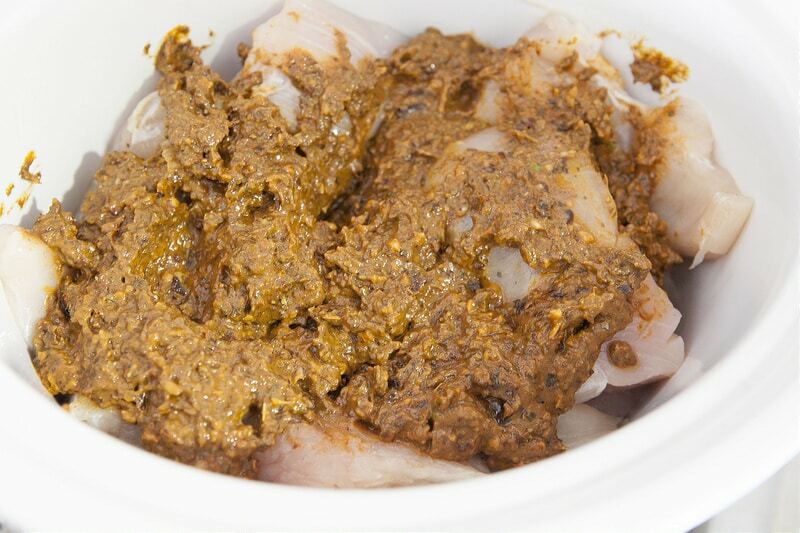 Allow to cool and then serve immediately, refrigerate or freeze. 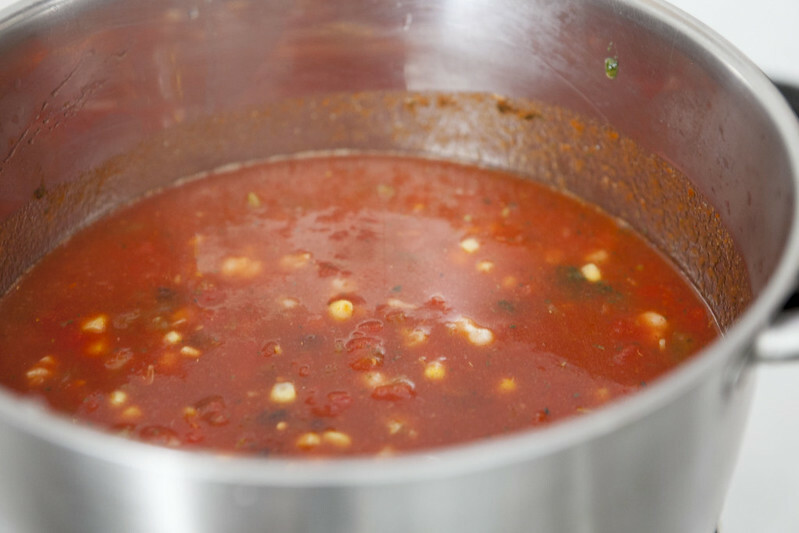 I'm glad you enjoyed this recipe Donna, thanks for sharing your tweaks! 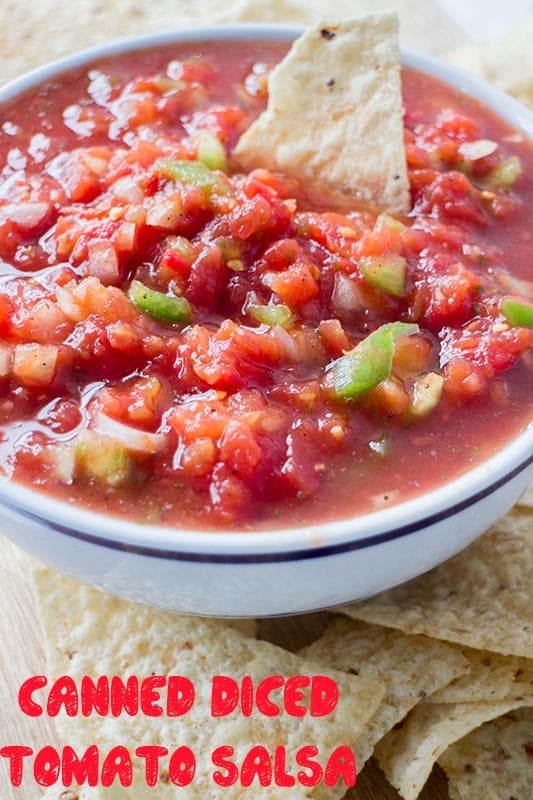 FAST and EASY Canned Salsa recipe made with diced tomatoes! 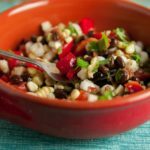 Just add green peppers and onions to this simple recipe and you’ll have a delicious chunky salsa ready to serve in minutes! 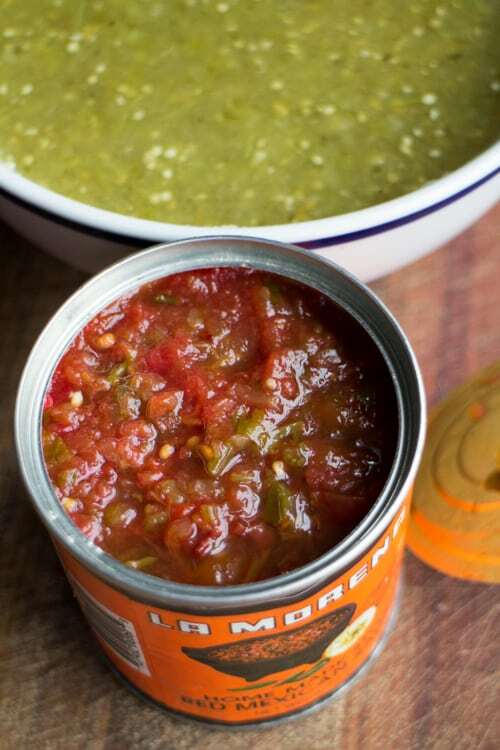 This canned salsa recipe tastes just like the salsa at your favorite Mexican restaurant! It happens to us all. We’re out of tomatoes so we can’t make Fresh Tomato Salsa from our garden. 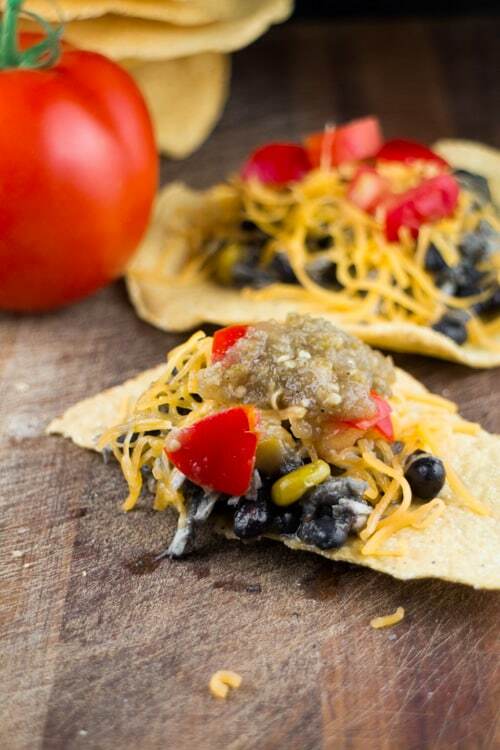 Maybe we need salsa for a get together. Maybe we need it for a recipe. 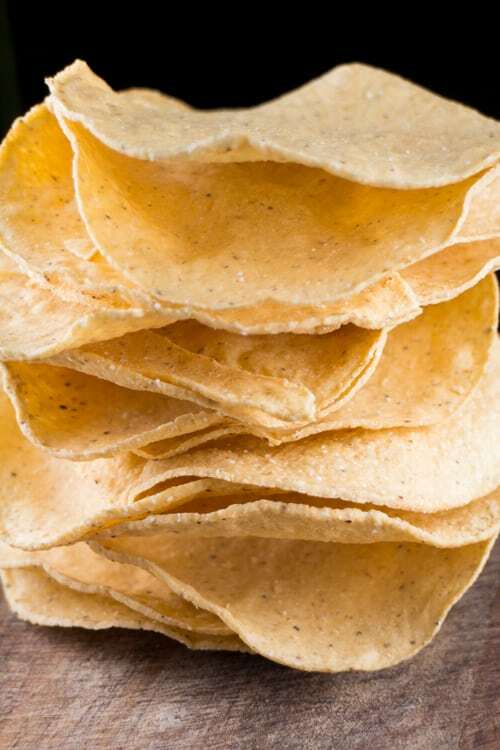 Maybe we’re just craving it with some chips. 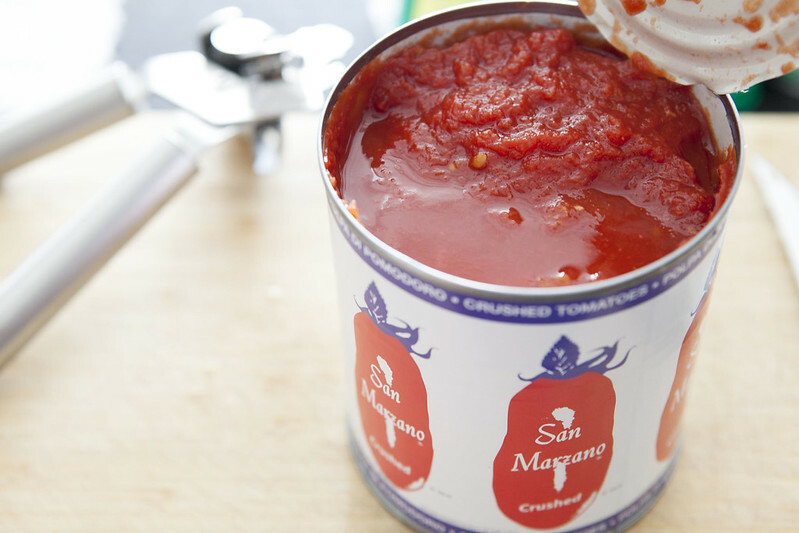 I’m here to help save the day by letting you know that you can make great tasting salsa with canned tomatoes! 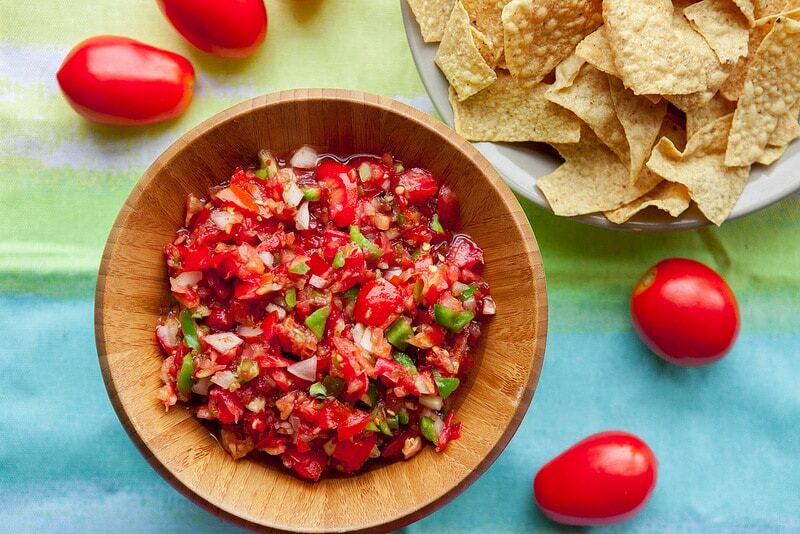 Let’s check out this easy diced tomato salsa recipe that you’re going to love! 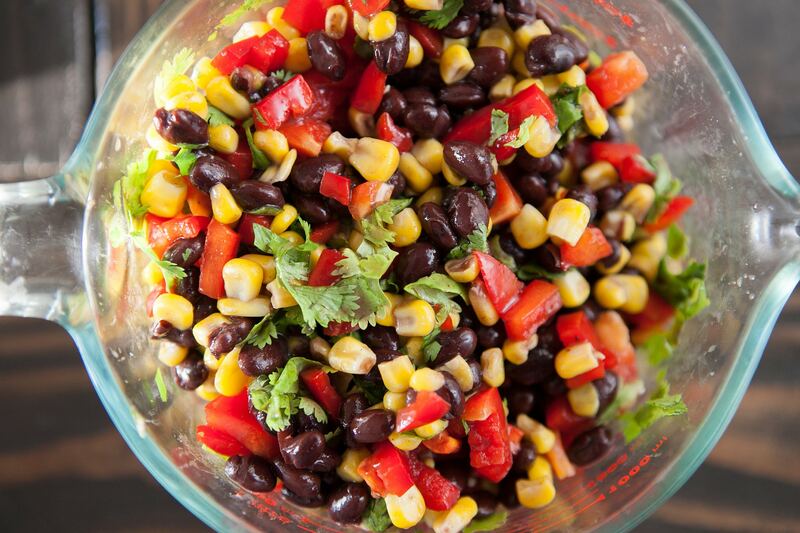 MEXICAN BLACK BEAN and CORN SALSA that takes 2 MINUTES to make! 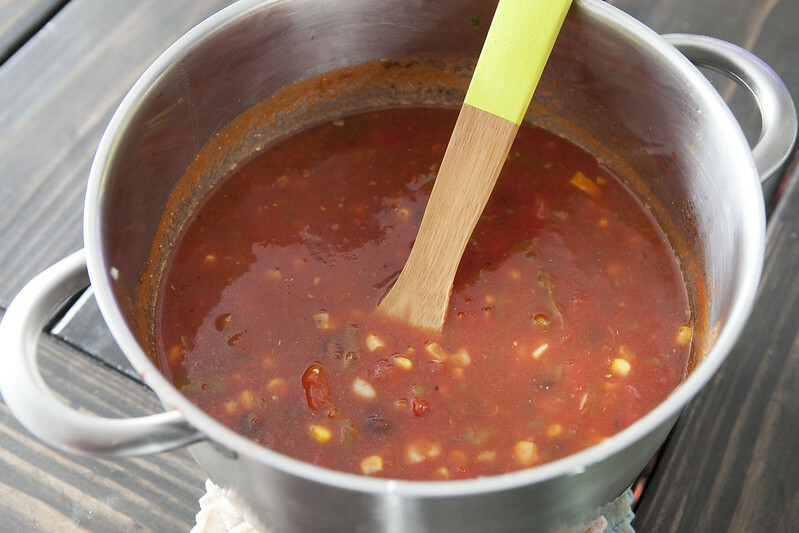 This easy homemade salsa recipe is full of fresh Mexican flavor! 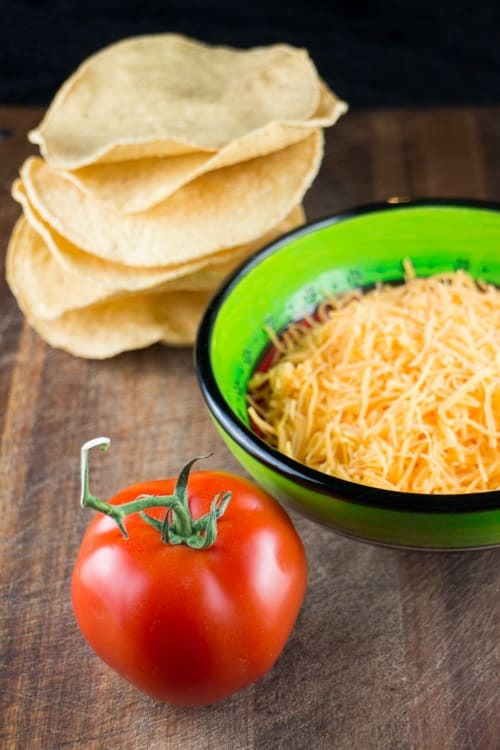 Eat this healthy dip with chips or serve as a salad. We love this Mexican Black Bean and Corn Salsa because it only takes 2 minutes to make and can easily be served as a dip with tortilla chips or as side salad. 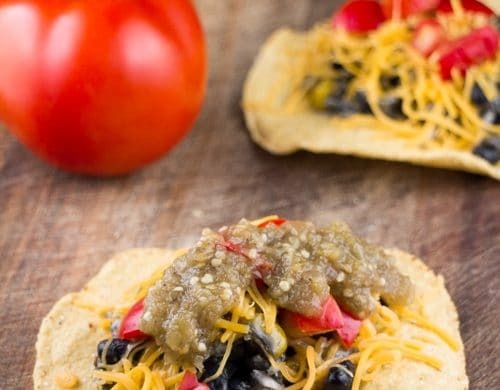 I find that I can make this recipe in the hot Summer months for picnics, or in the cold Snowy months with slow cooker tacos and we love it equally. 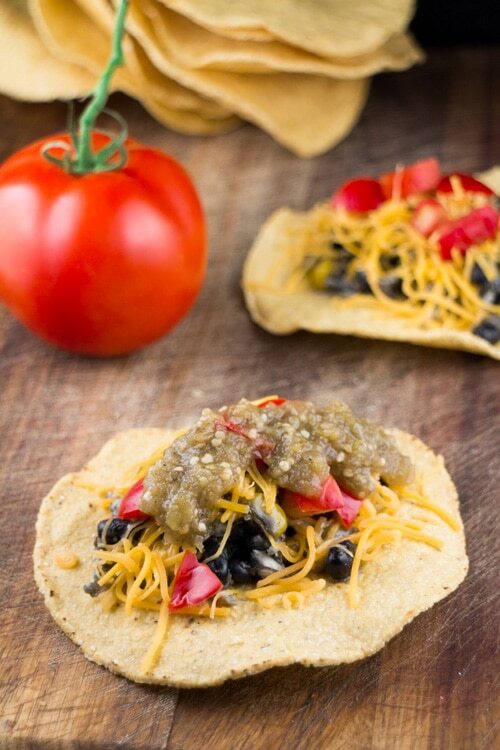 We eat Mexican food very often in our house so this salsa is a perfect fit! 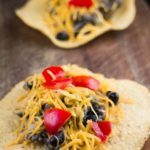 I see so many tasty taco recipes from bloggers but recently I came across a book that I fell in love with it. 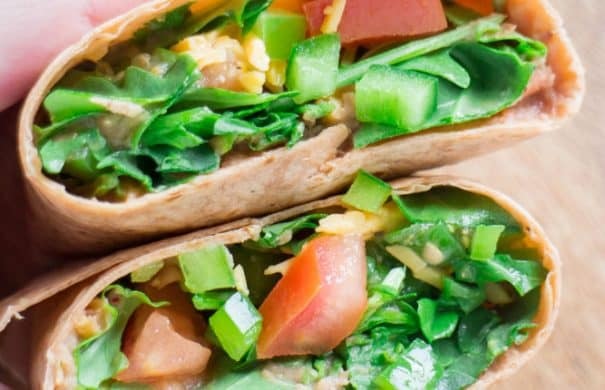 It’s “The Taco Revolution” and features over 100 recipes to “Master America’s New Favorite Food”. It’s not often that Matthew and I both have to fight over a cookbook but when he saw this on my desk his eyes nearly popped out of his head. “Tacos!” he exclaimed. “Tacos!” I exclaimed. 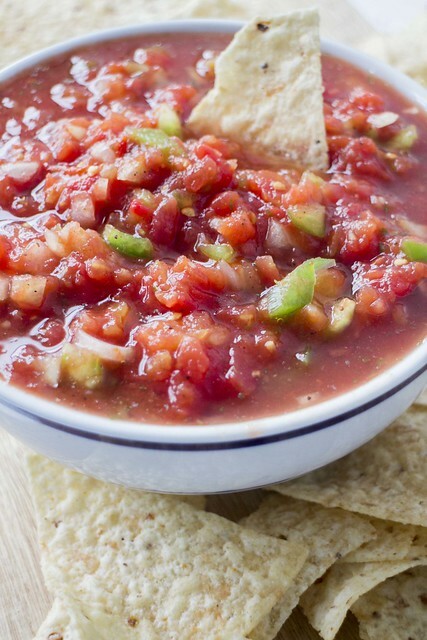 In this cookbook there’s a section devoted to one of my favorite foods – salsa! 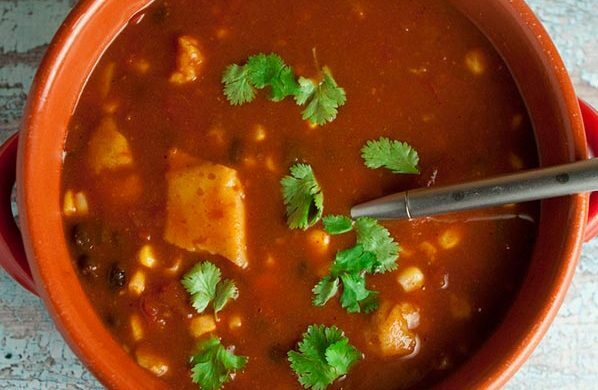 From slow cooker tacos, to salsa, to cornbread, I love it all. 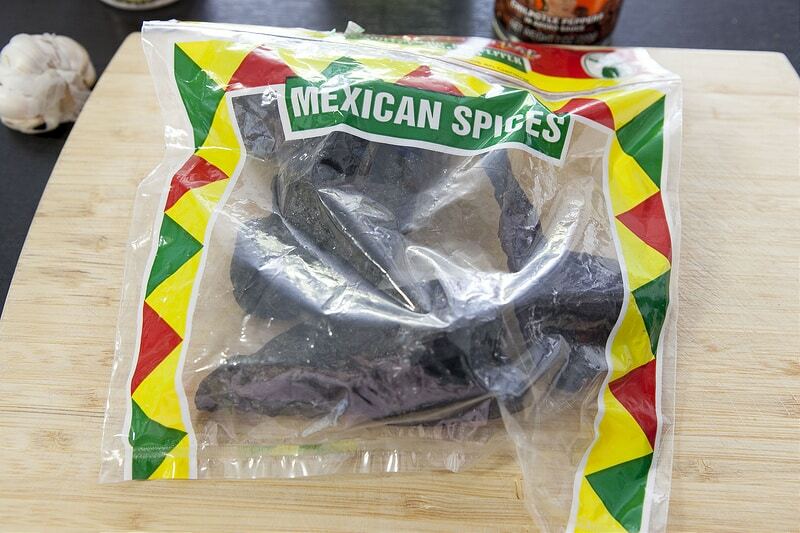 In fact check out my Mexican recipe selection here for lots of other recipes! 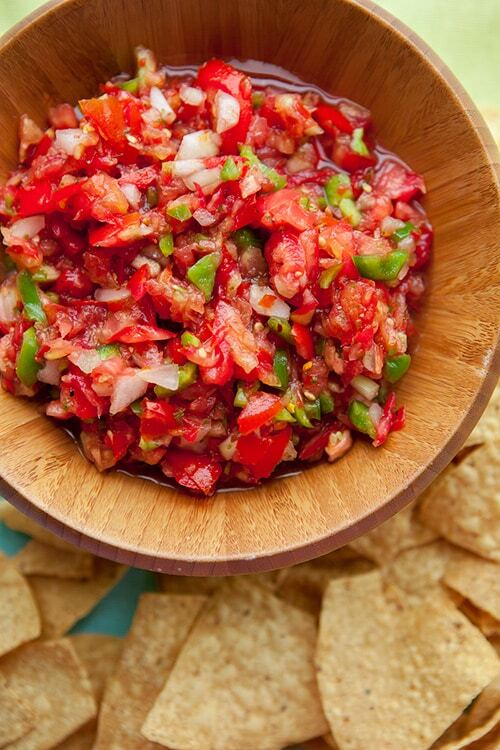 Make this salsa and serve it with your next Mexican dish! 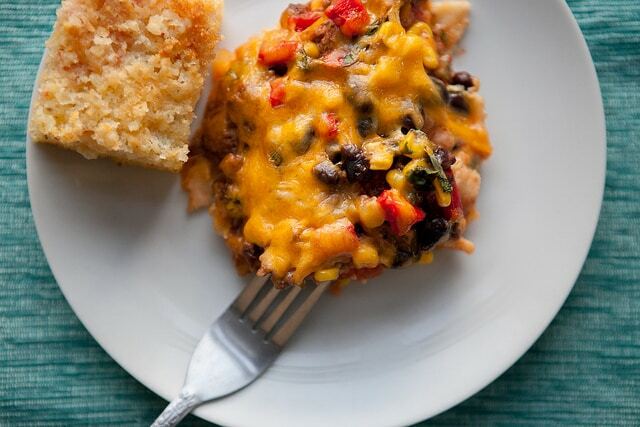 Make sure to refrigerate leftovers. 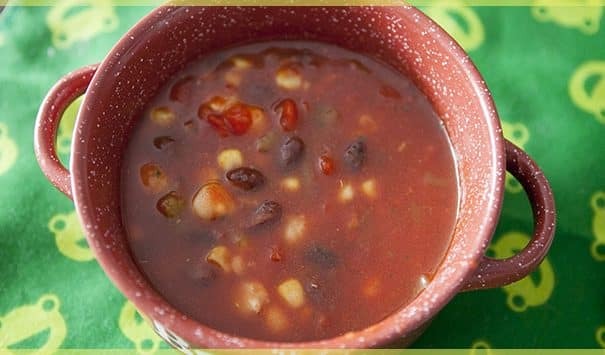 Easy to make tamale soup recipe that only takes 20 minutes to make! 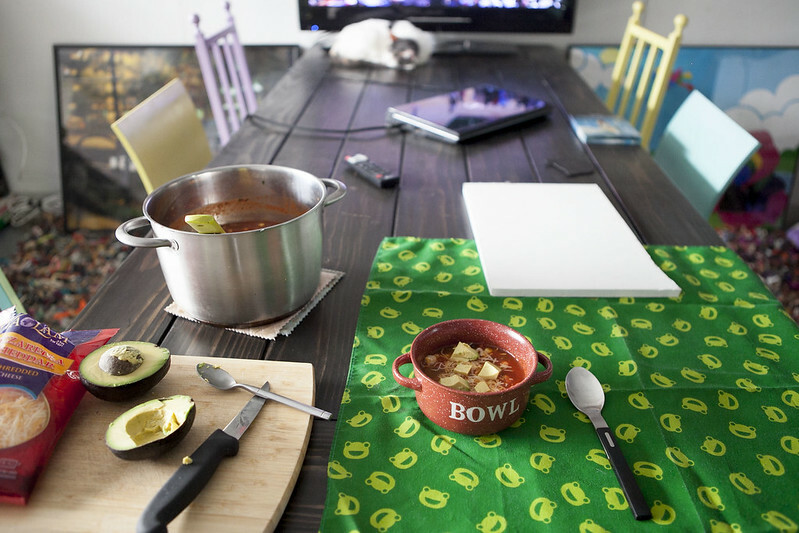 Are you like us and are extremely indecisive when it comes to dinner when there are no plans? “What’s for dinner?” is the worst question in the world when the response is “I don’t know, what do you want?” That leaves Matthew and I both opening the freezer, looking in the vegetable drawer, browsing the pasta selection and usually ends up with me on the ground crying “Just eat without me! I can’t decide!”. That’s what hungry bellies do, they make you irritable. So enter this Easy Tamale Taco Soup. I’m really big on quick meals when we’re on deadline for projects. 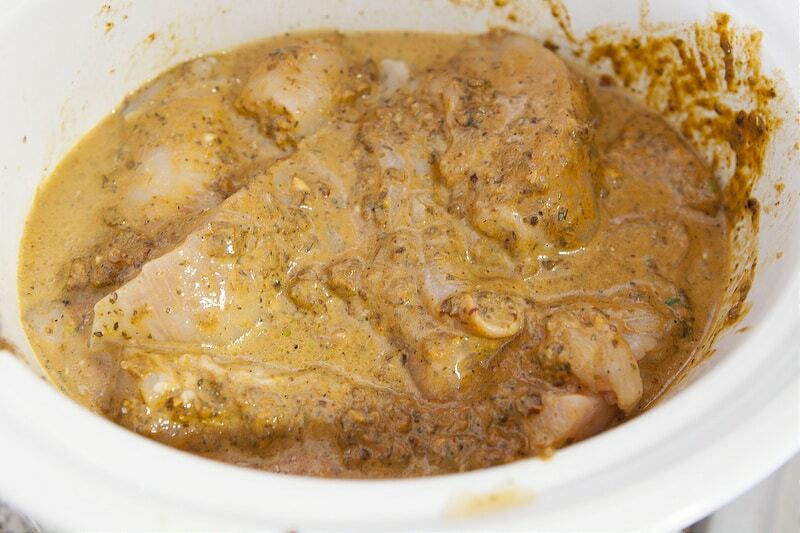 Slow cookers rule, but sometimes I don’t have time in the morning to get it started so I need something super quick. 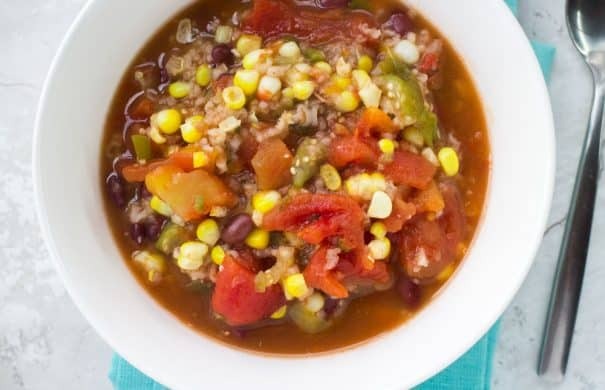 That’s why canned goods and frozen vegetables rule. 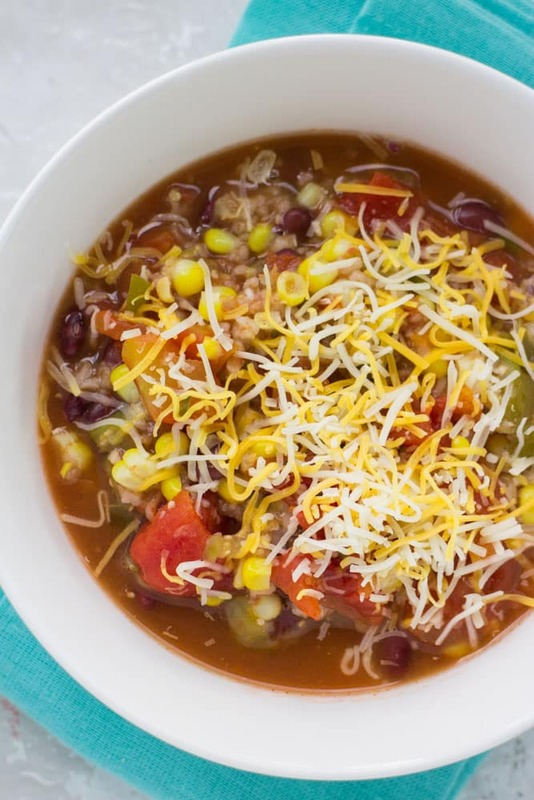 This Taco Soup is made in 20 minutes. 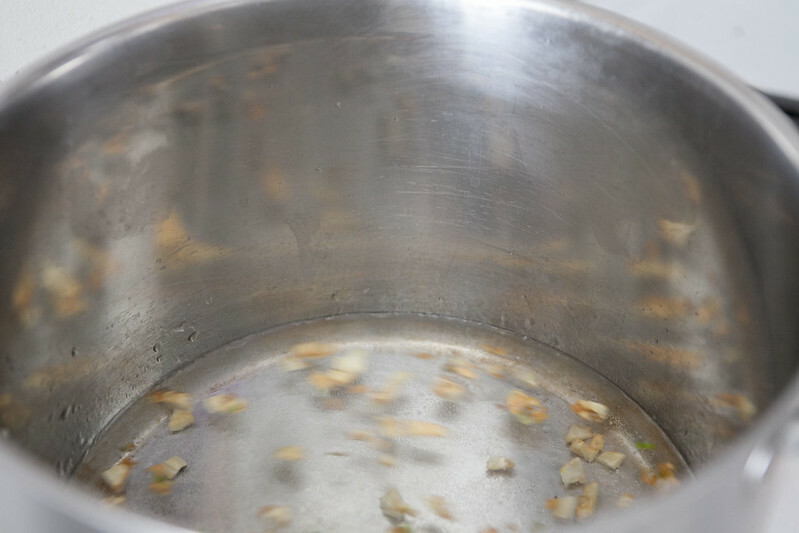 You use up all your energy opening up the cans, dump them into a pot, boil and simmer for 20 minutes. Then you sit at your dinner table and eat it about 2 minutes because you are that hungry. 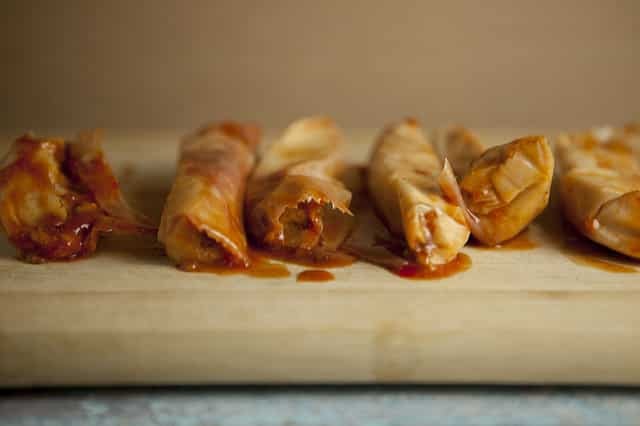 Do you guys know about Homel Beef Tamales in Chili Sauce? I recently came across them in my travels at the grocery store. 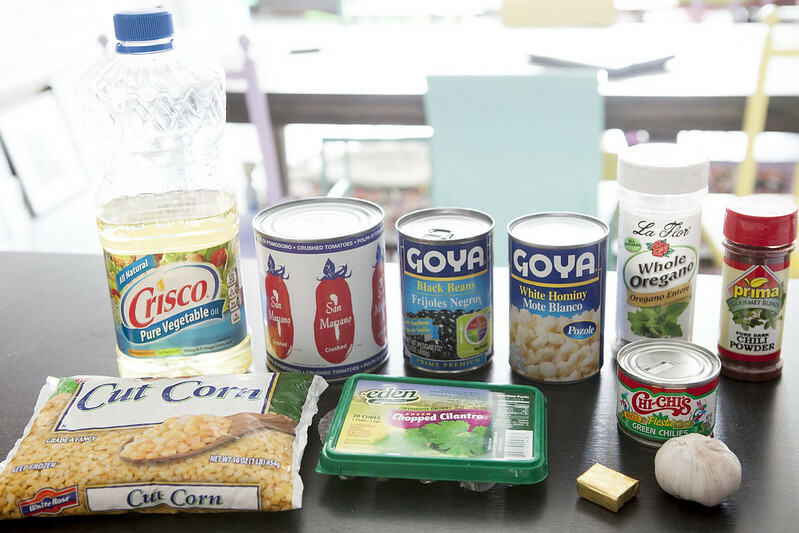 They are basically Tamales in a can. They scream out “lazy”. I love it. 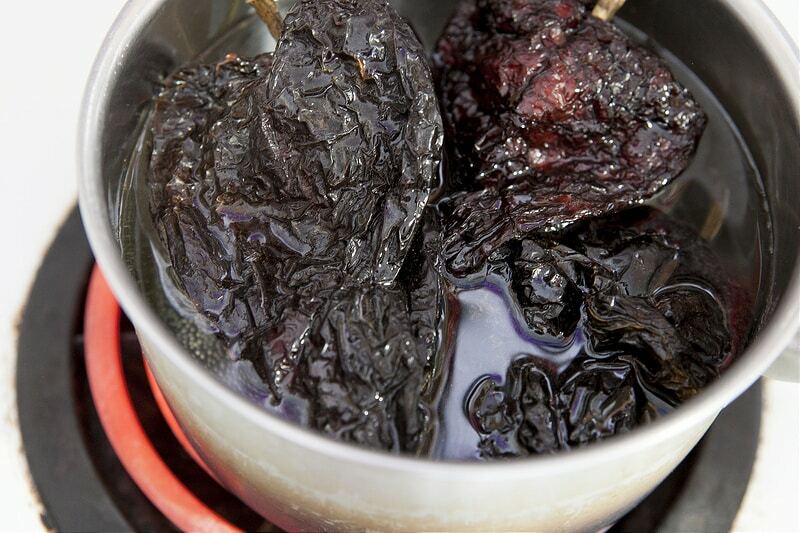 And the ingredients aren’t frightening at all for Tamales in a can: Water, Beef, Tomatoes (Water, Tomato Paste), Corn Meal, Corn Flour, Masa Harina, Salt, Chili Powder (Chili Peppers, Flavoring), Lime, Cornstarch, Paprika, Spice.” No additives, no preservatives, no words I can’t pronounce. Pretty cool right? And even better the entire can is 340 calories. 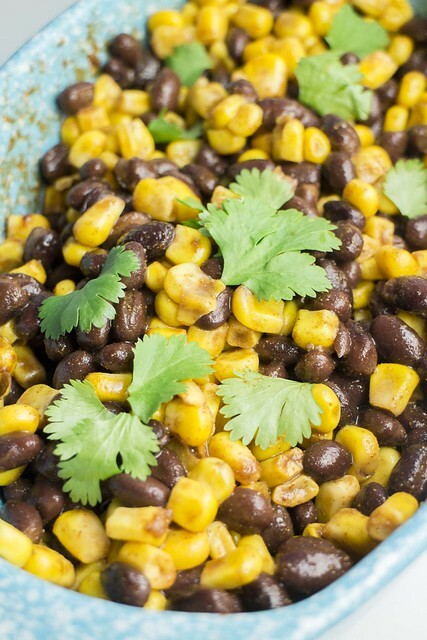 Throw this in a pot with just a full lineup of beans and corn and you got a pretty healthy extra quick meal. 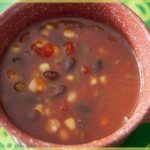 I hope you enjoy this easy Tamale Soup! 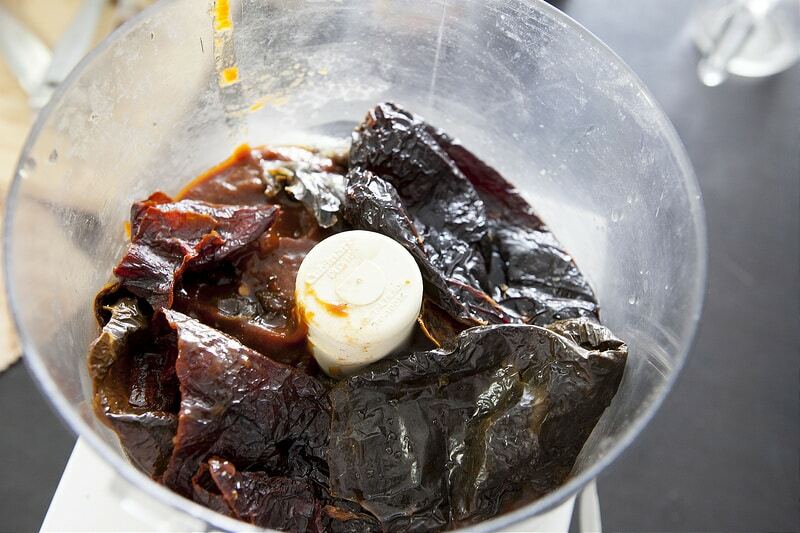 Remove paper wrappers on tamales and cut Beef Tamales up into quarters. 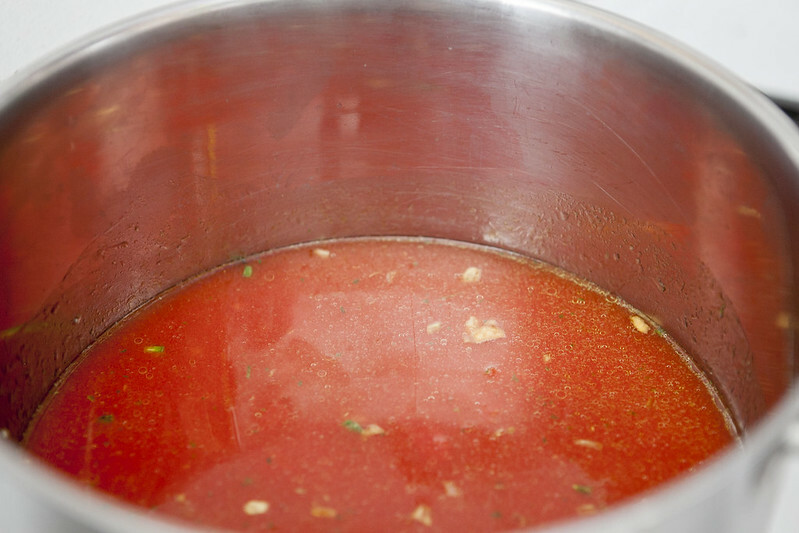 Mix all ingredients in large pot. 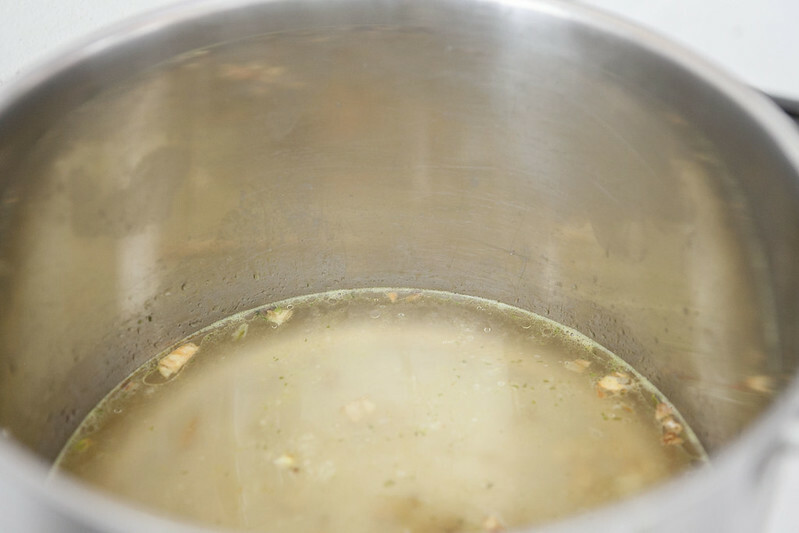 Bring to boil, simmer for 20 minutes. 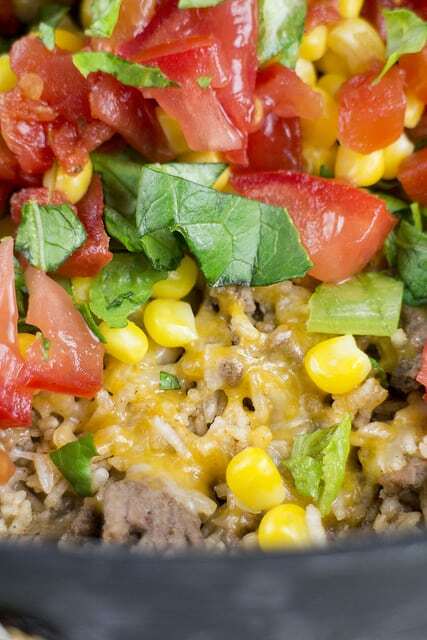 Serve in bowls, add shredded cheddar cheese and fresh cilantro on top. 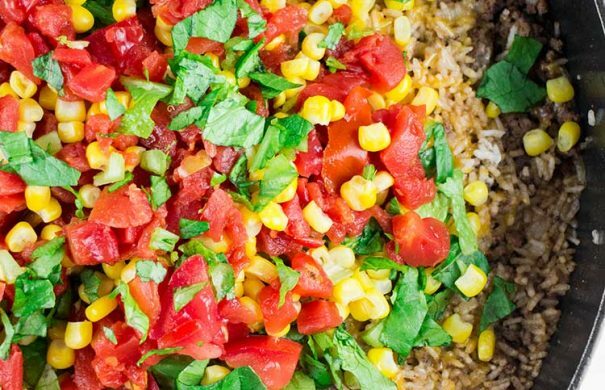 That green rice bowl sounds like it would be perfect for this evening's dinner! 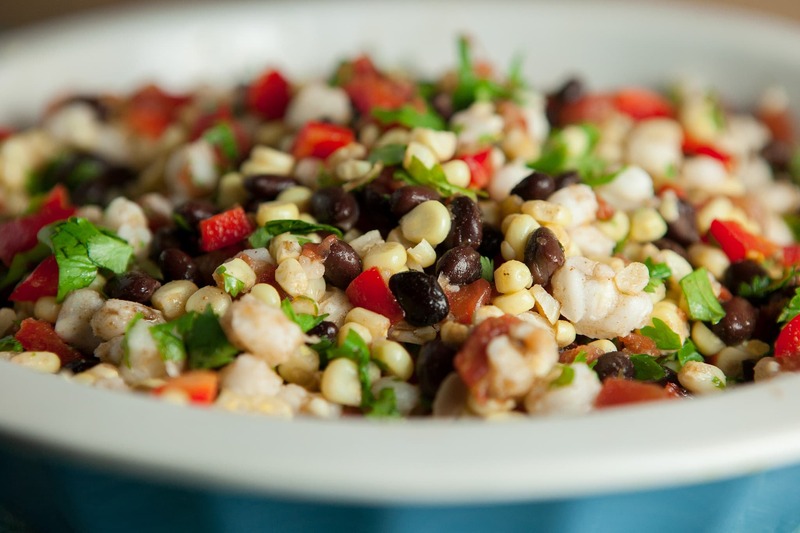 Fresh Mexican Corn Salad is a easy and delicious recipe using fresh ingredients! 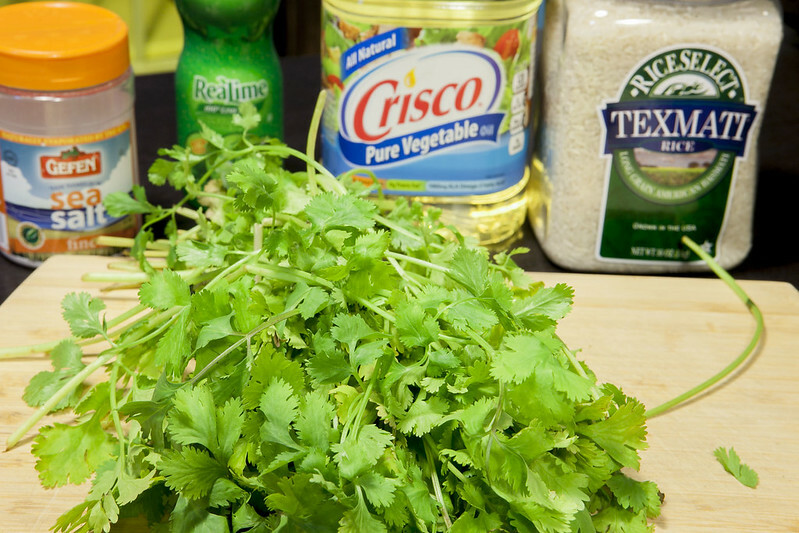 This salad only takes 5 minutes to make and uses NO mayo! 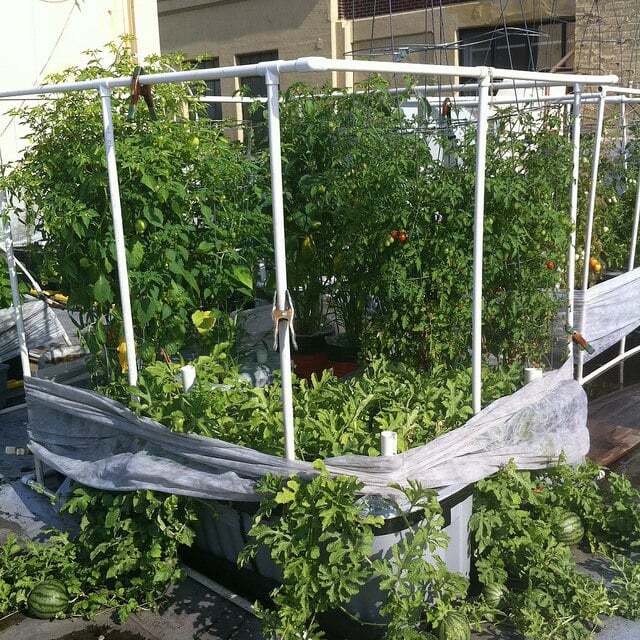 Growing corn in a box on a rooftop in New York City is pretty cool. 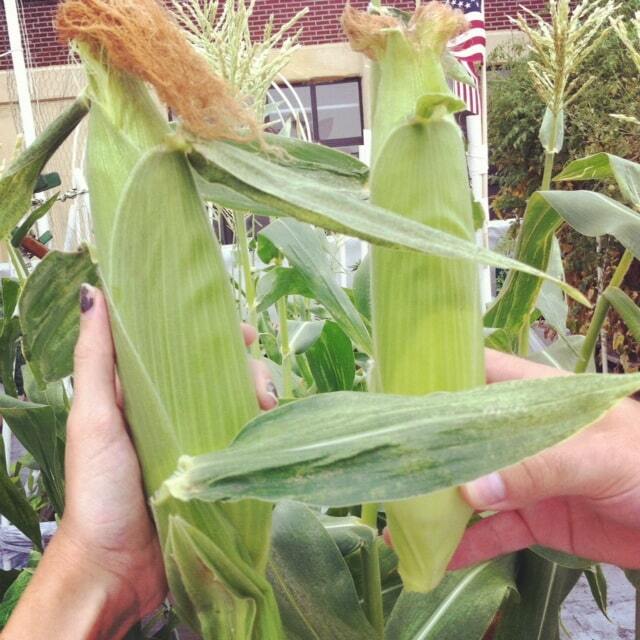 When we start to spot the ears of corn and I can start to shake the plants to help pollinate I get very excited. As you probably can guess, I do a corn dance. It looks the same as my broccoli and pumpkin dance. I pretty much have the same garden dance move for all our plants, I put my hands out to my side and do a 60s Twist move. One day I might post the dance on here but I’m not sure if you are ready for that yet. Lately I’ve been craving vegetables for dinner. 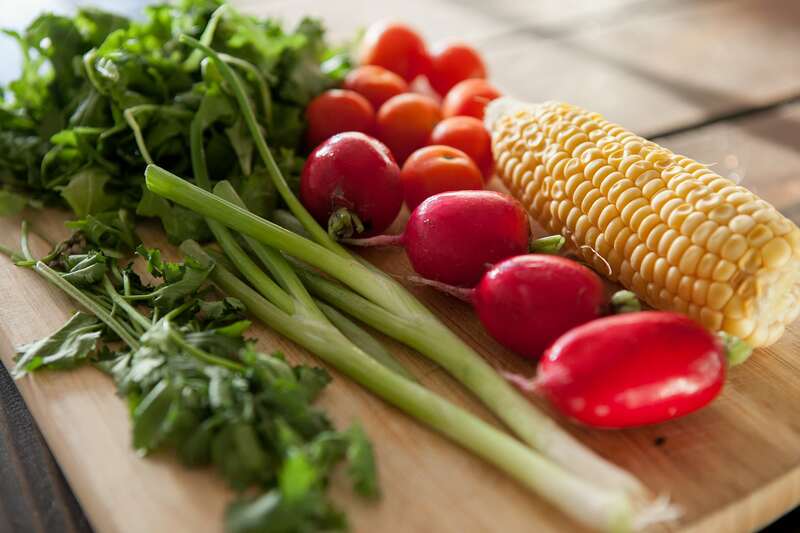 Lots and lots of vegetables and nothing else. 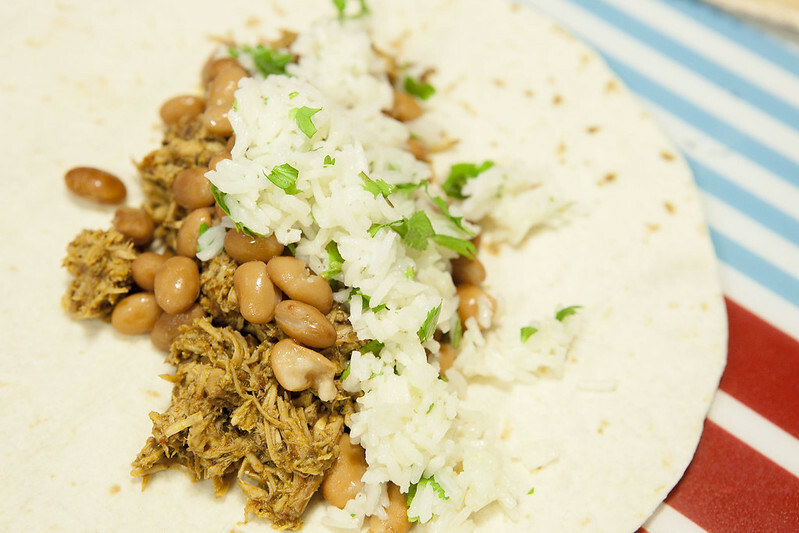 My other half loves meat for dinner (like these Slow Cooker Chicken Tacos) but I have been persuading him to try a happy veggie meal once a week, and I’m hoping we can get that up to 2 nights a week soon. 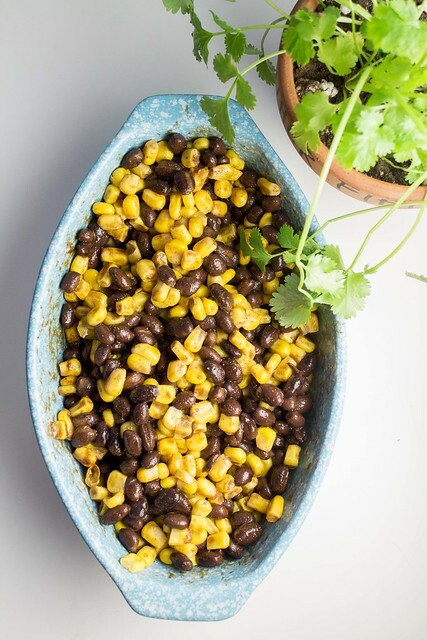 If I served this Mexican Corn Salad more than once a week I know I could because we love this dish. 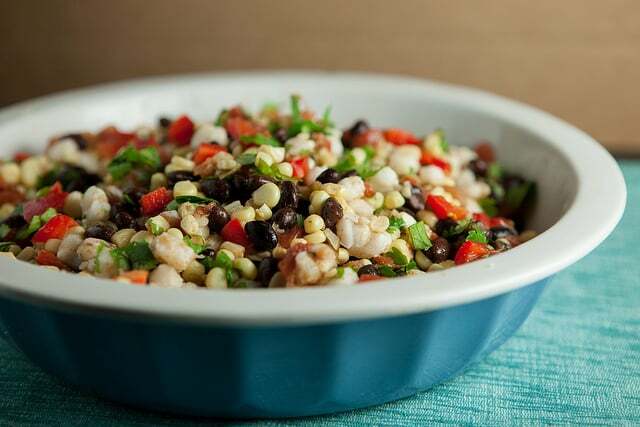 It’s full of fresh corn kernels cut right off the cob, black beans, diced tomatoes, bell peppers and my favorite: hominy. 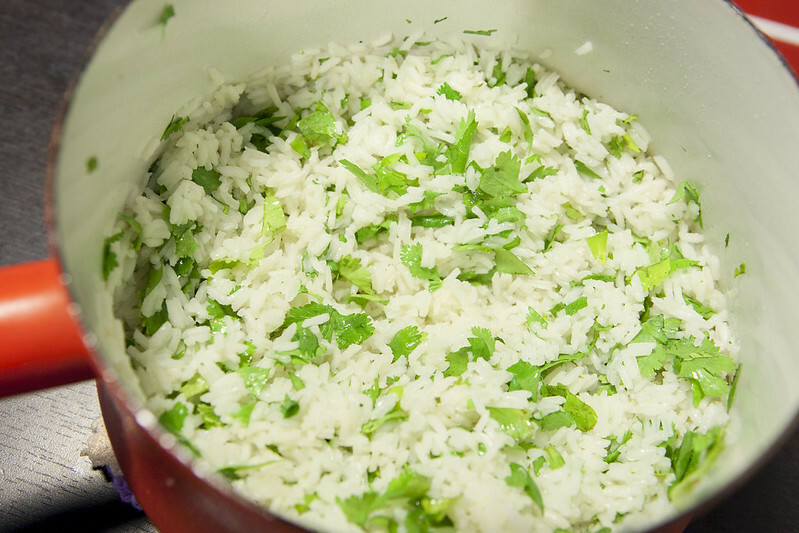 To spice it up we add in cumin, cilantro and lime juice. 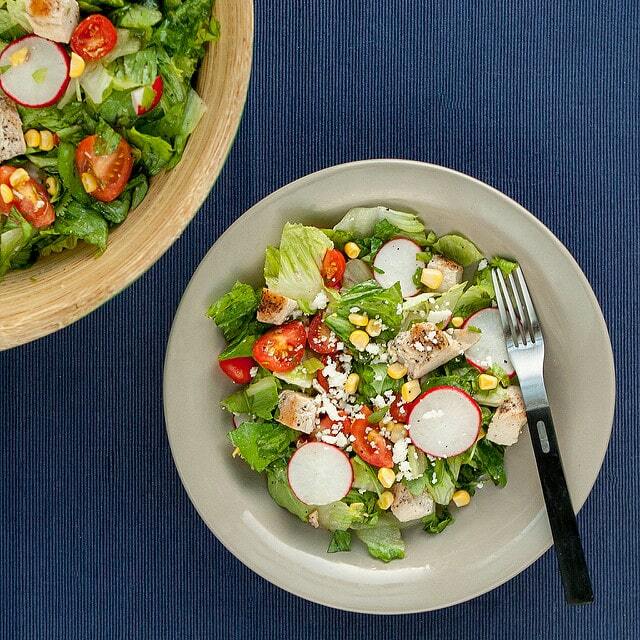 Just thinking about this salad makes me want to cancel dinner plans for tonight and cut up some corn. Speaking of corn, isn’t it just beautiful? Even the husks are pretty. And when the salad comes together you are going to be in love too. 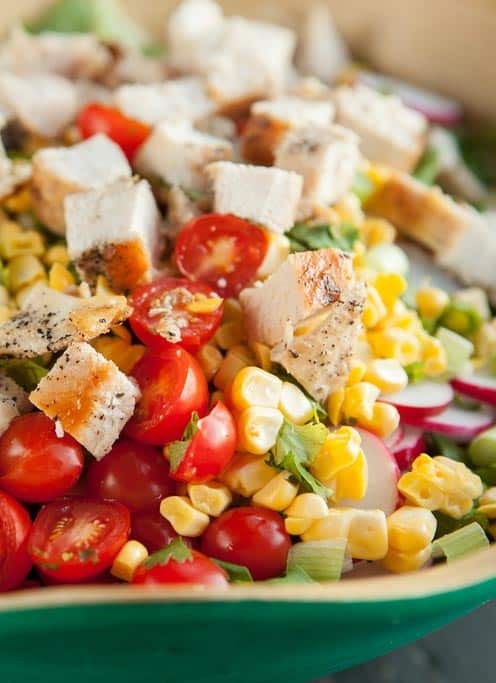 The best thing about this salad is that it takes 5 minutes to make- amazing, right? 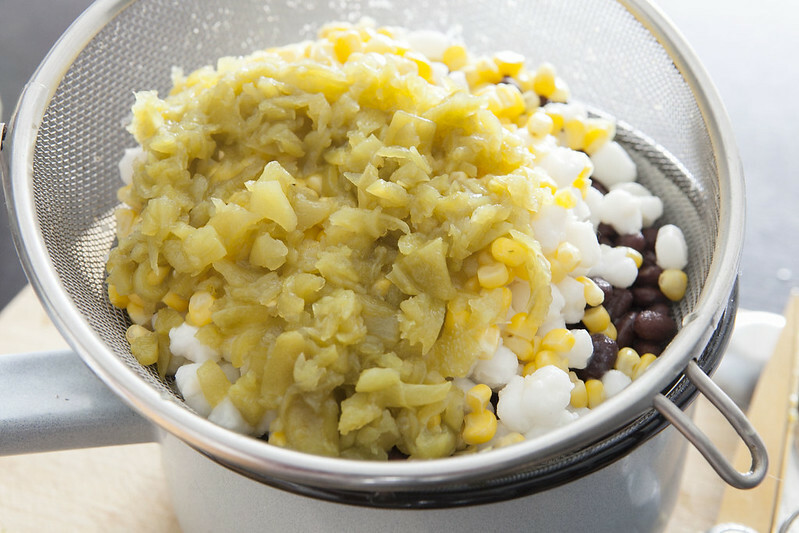 The only thing that is cooked is the corn and that is only for 3 minutes. 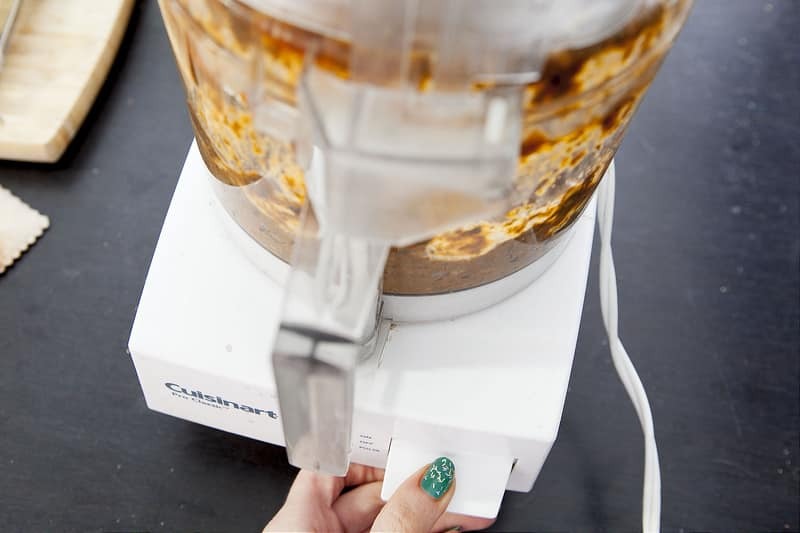 So if you’re craving a delicious dinner full of vegetables and you want it made within minutes, look no further. Enjoy! 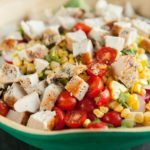 Want more garden fresh salad recipes? Check out my Kale Salad and Cantaloupe Salad. 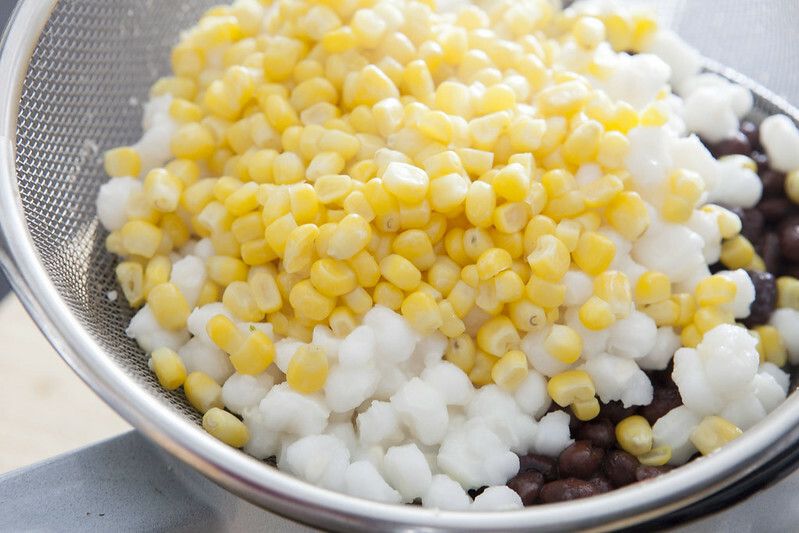 Place corn in large pot of boiling salted water and cook for 3 minutes. 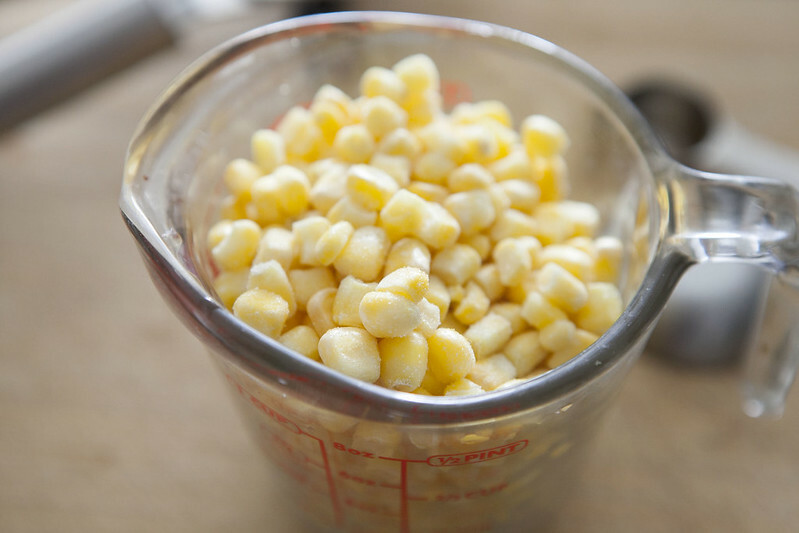 When corn is cool, cut kernels off cob. 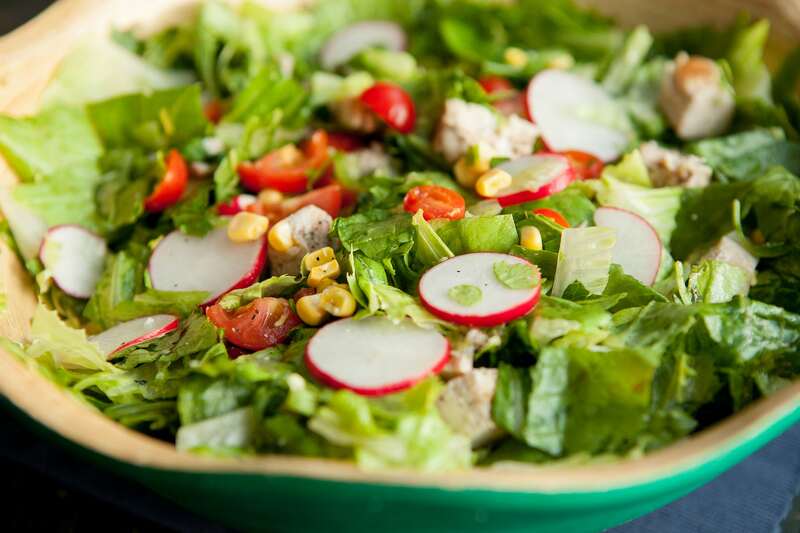 Chopped Mexican Chicken Salad is a quick and healthy recipe that uses fresh ingredients. 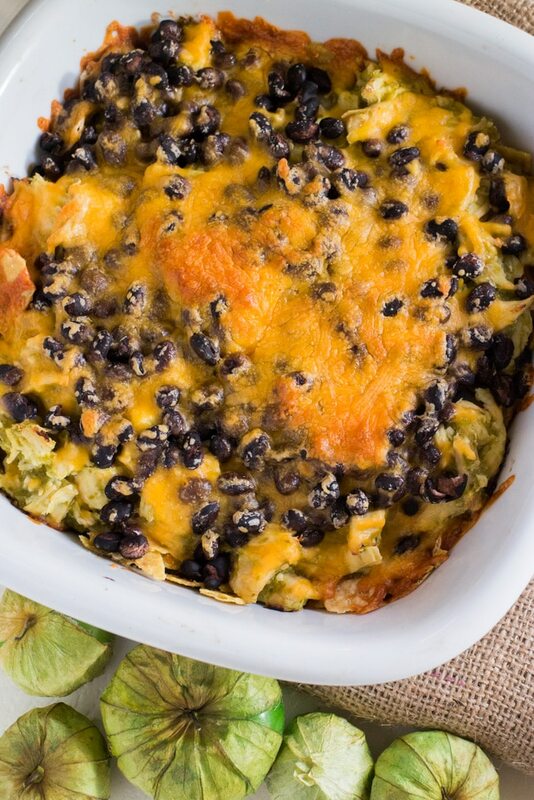 You can serve it as a main or side dish. As some of you know I’m not a huge salad eater and that is pretty much a sin coming from a gardener. 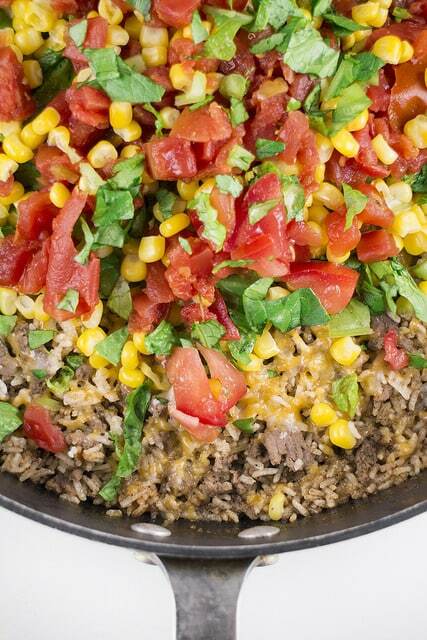 To get to me eat more salads, I have found that if I make it more Mexican inspired it becomes a instant hit. 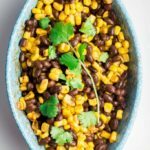 I gave this salad a Mexican taste with ingredients and spices and I loved it so much we had it for dinner twice in 1 week! 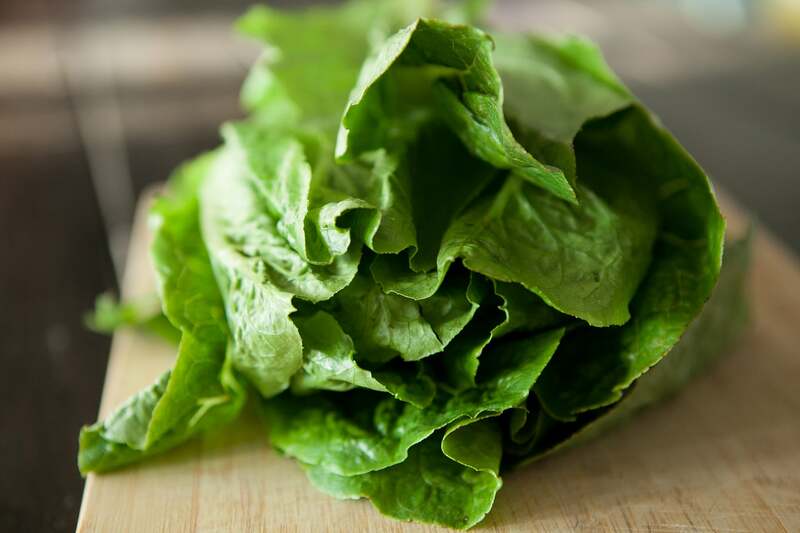 Fresh lettuce from the garden, can’t beat the taste! 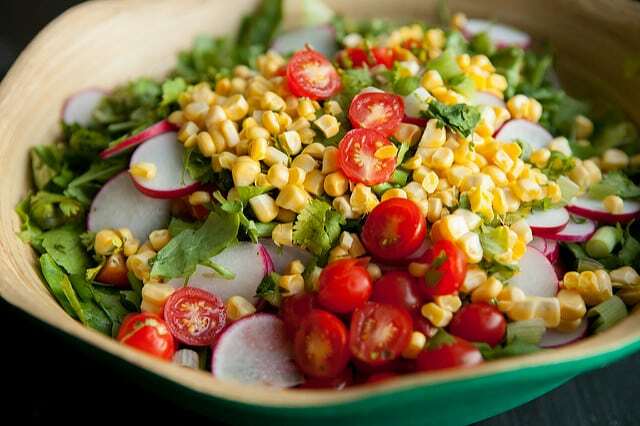 Arugula, Cilantro, Scallions, Radishes, Tomatoes and Corn! This chicken was some of the yummiest chicken I ever tasted. 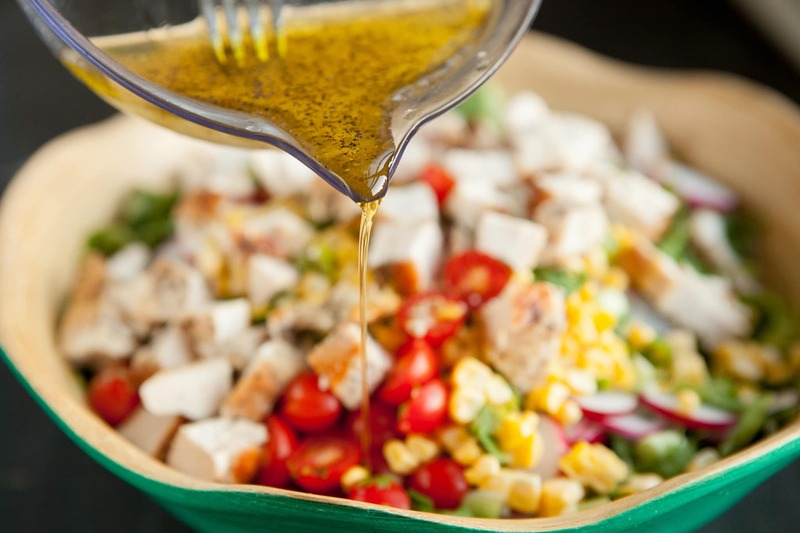 Minutes later throw all your vegetables and herbs in a bowl..
Add your cut up chicken..
Sprinkle your olive oil dressing on top.. 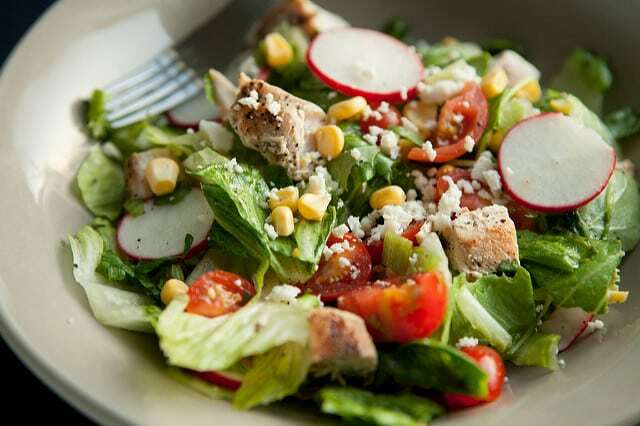 Mix up and you have one beautiful and fresh salad! 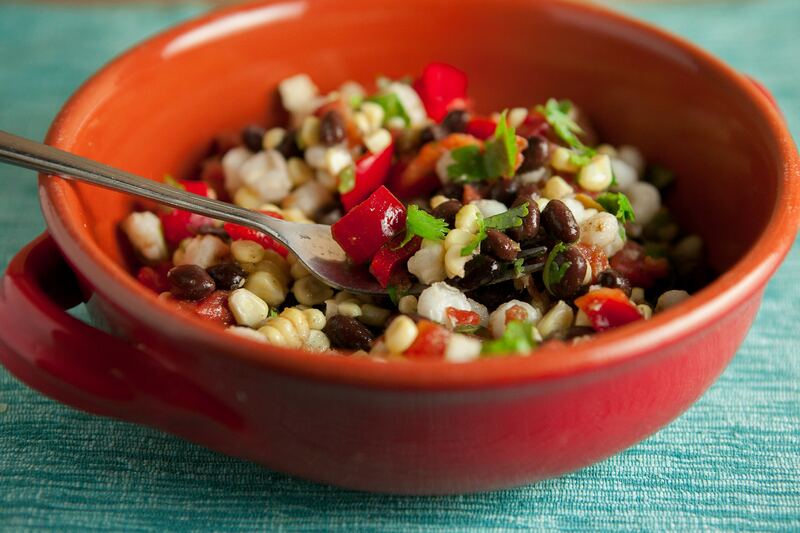 Serve and sprinkle some Queso Fresco on top. 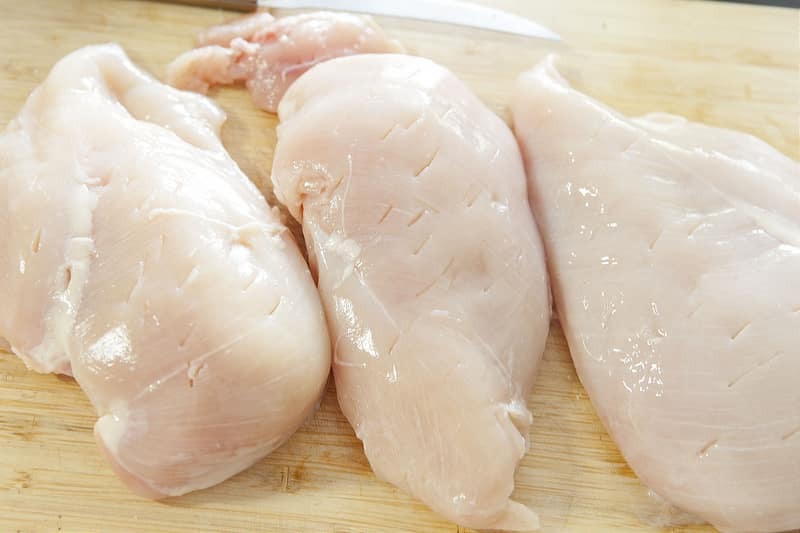 Pat the chicken dry with paper towels. 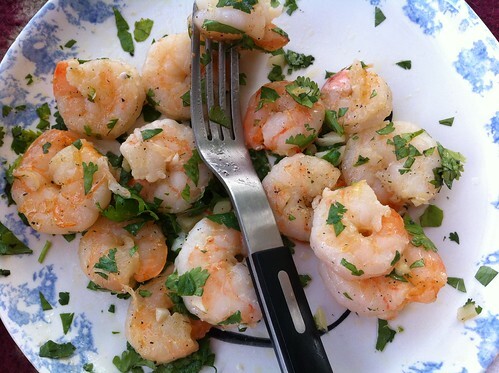 Season it all over with salt and pepper.In a large pan, heat some olive oil on medium until hot. 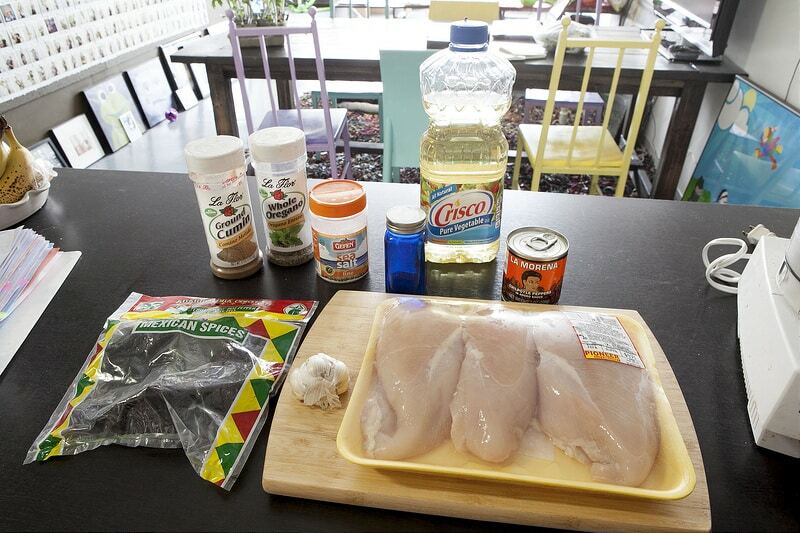 Add the chicken and cook 6 to 8 minutes per side, or until golden brown and cooked through. 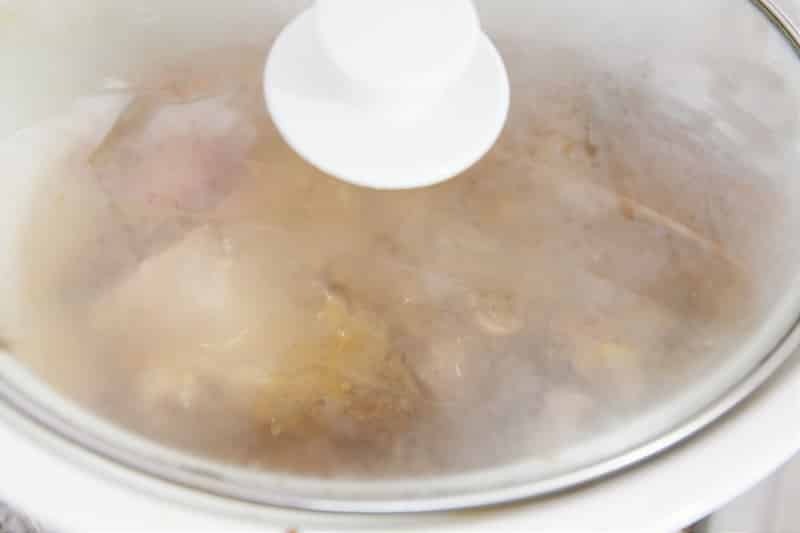 While the chicken cooks and cools, wash and dry the fresh produce. Cut the radishes into wedges. Cut the cherry tomatoes into quarters. Thinly slice the scallions. 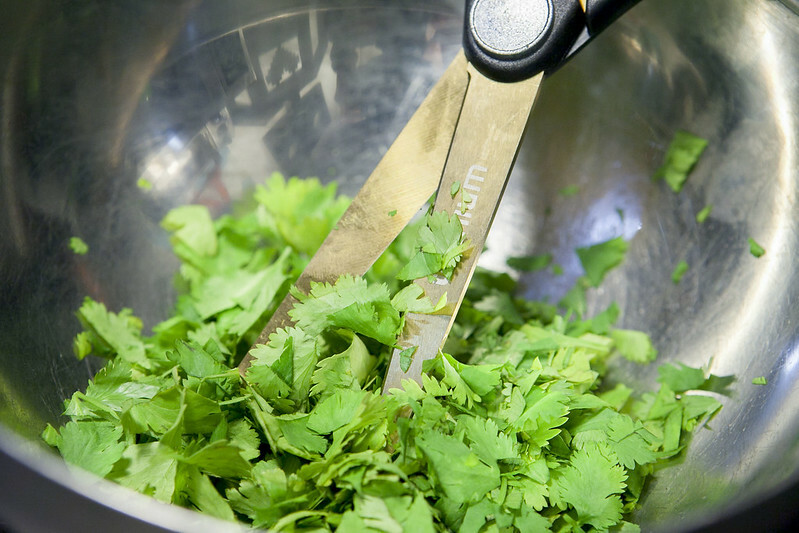 Roughly chop the cilantro. 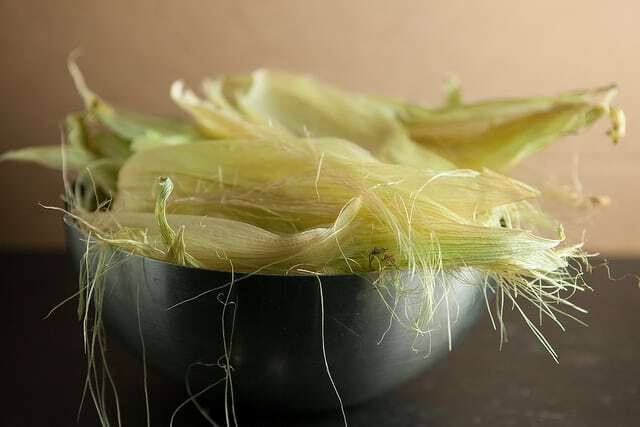 Peel off the husks and remove the silks from the corn. 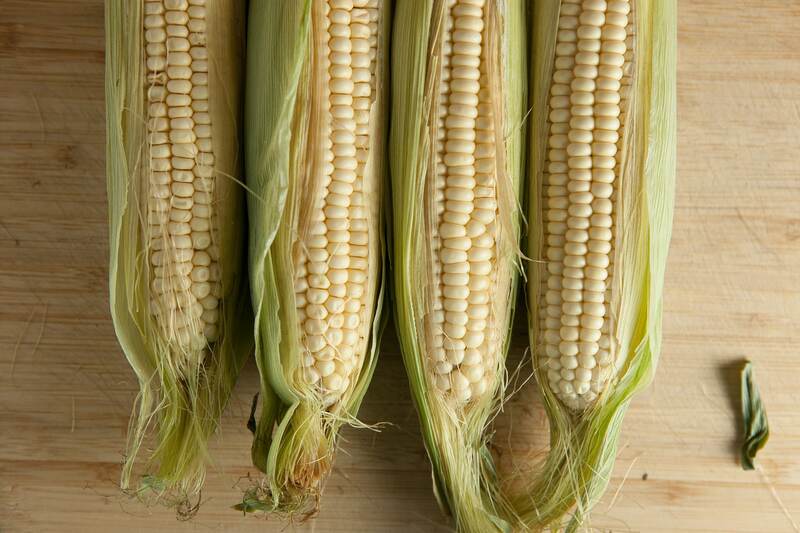 Using a knife in a sawing motion, cut the kernels off the cob. 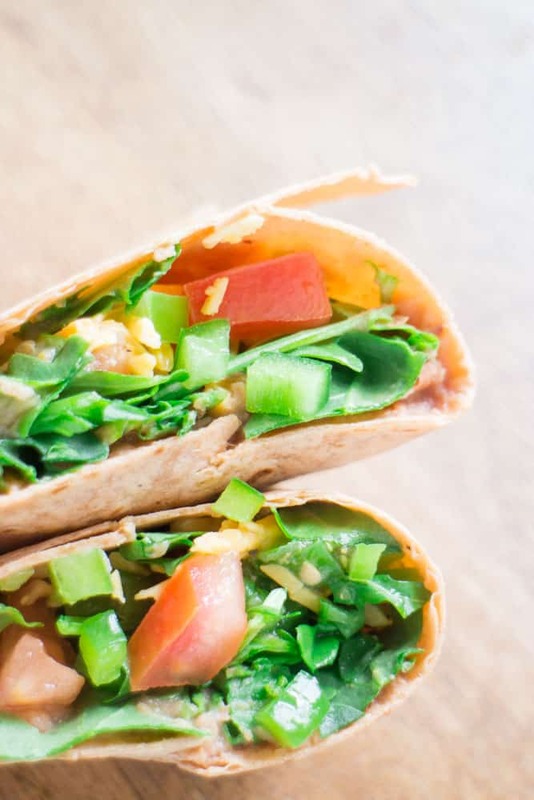 Chop the romaine lettuce into small, bite-sized pieces. 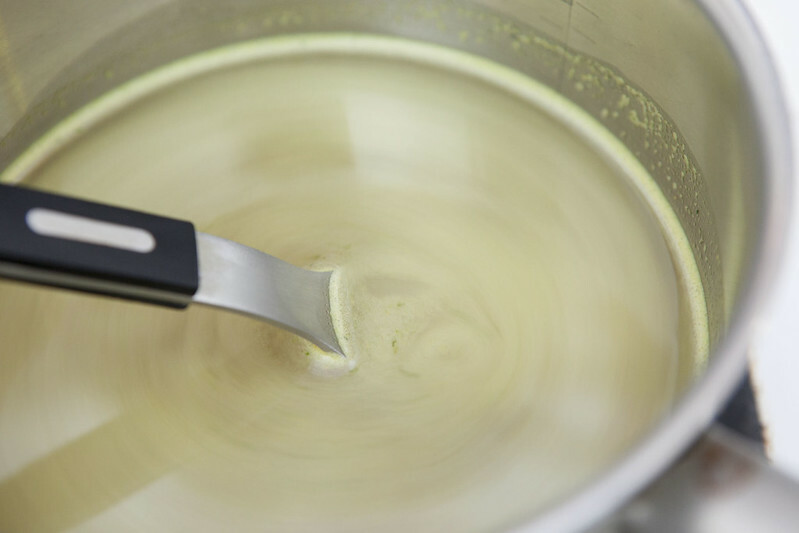 In a small bowl, combine the juice of the whole lime and about 2 tablespoons of olive oil.Whisk until blended and season with salt and pepper to taste. 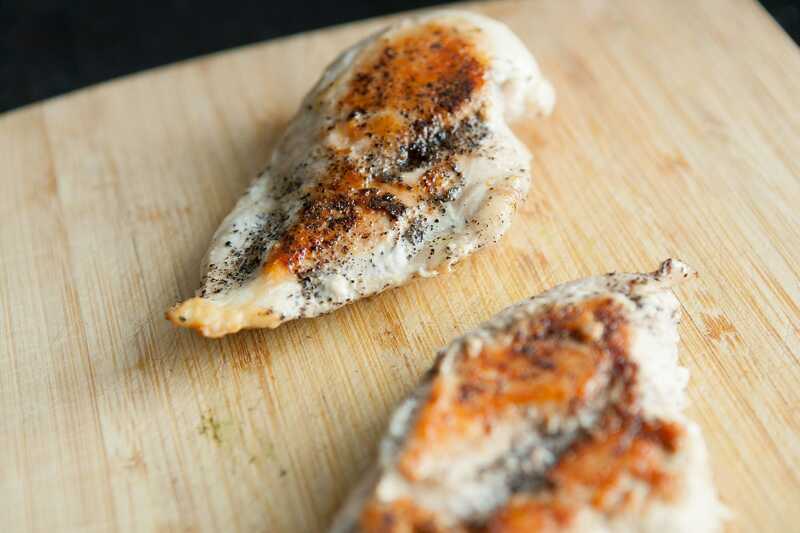 Chop the cooled chicken into bite-sized pieces. Add the chopped chicken to a large bowl along with the radishes, cherry tomatoes, cilantro, corn, romaine lettuce, and arugula. 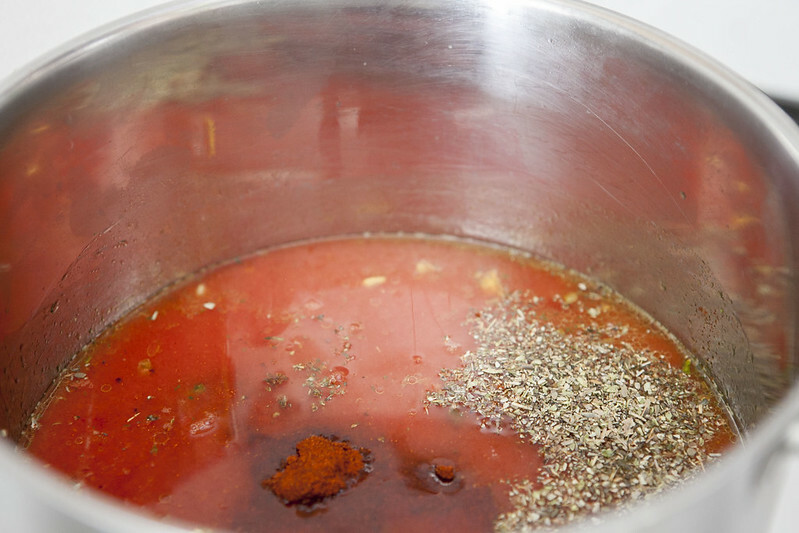 Add some of the dressing (you may not need all of it) and toss to coat. Season with salt and pepper to taste. 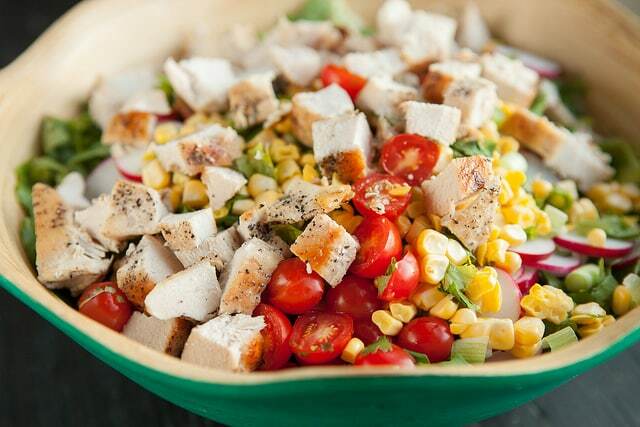 Divide the salad between 2 bowls. 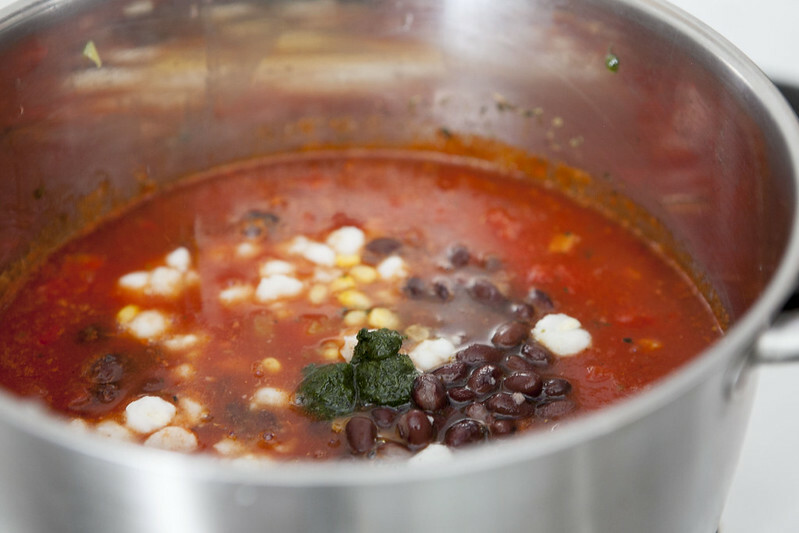 Crumble half the queso fresco over the top of each. Garnish with the scallions. Enjoy! Hope you enjoyed it Lisa! 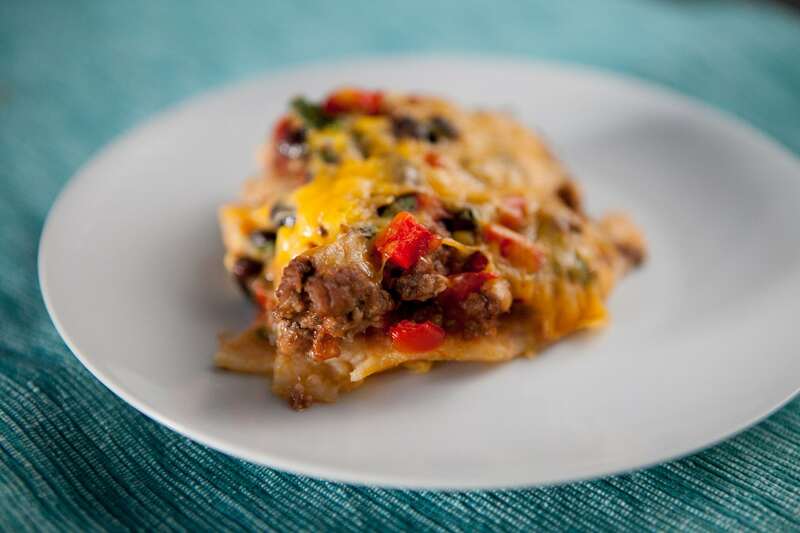 Easy to make Taco Enchilada Casserole recipe. 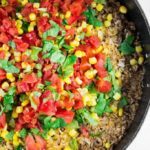 This Mexican recipe uses ground beef, salsa, beans, peppers and more! 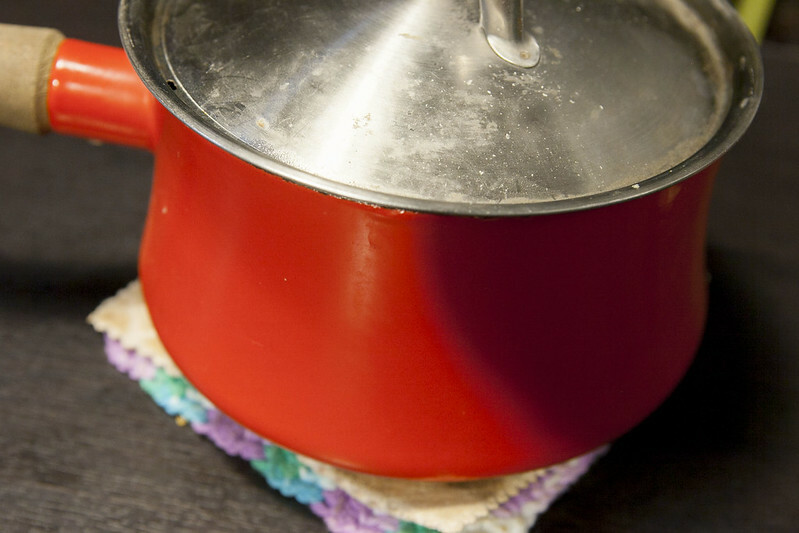 Casserole takes 30 minutes to bake. 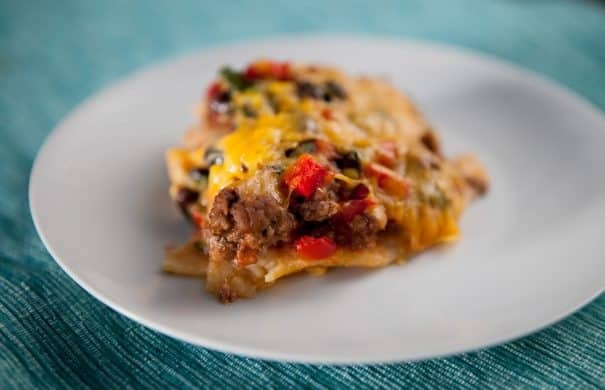 I really like tacos and I really like casseroles so when I’m able to put them together it’s like sweet magic recipe worlds combined. 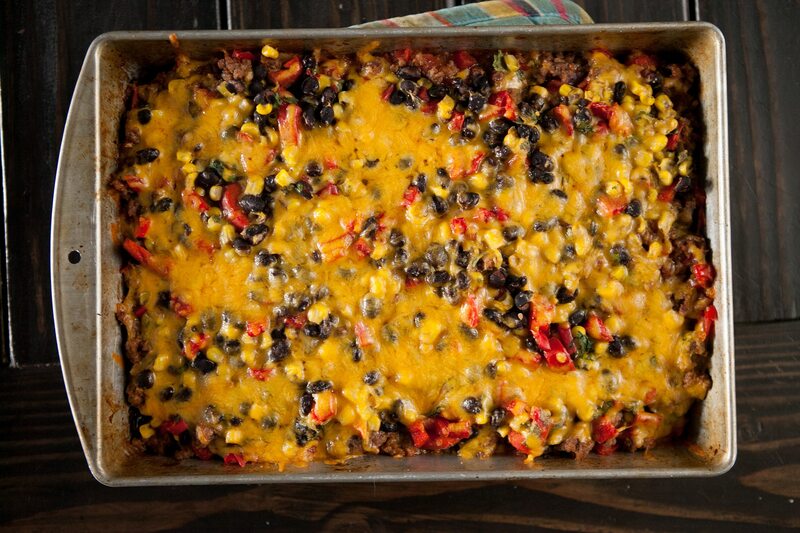 For example there’s my go to Taco Casserole, Slow Cooker Pepper Steak Tacos, Crockpot Chicken Tacos, Cauliflower Pizza Casserole. 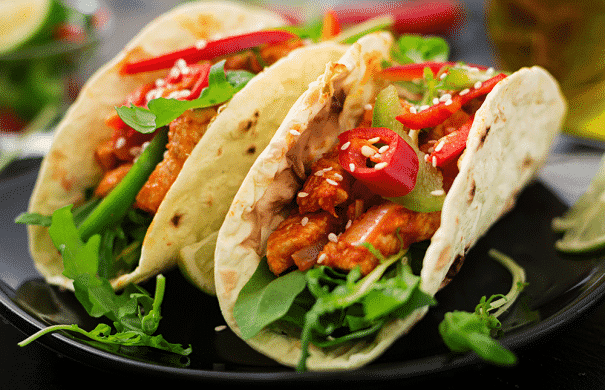 Tacos? Yes, please. 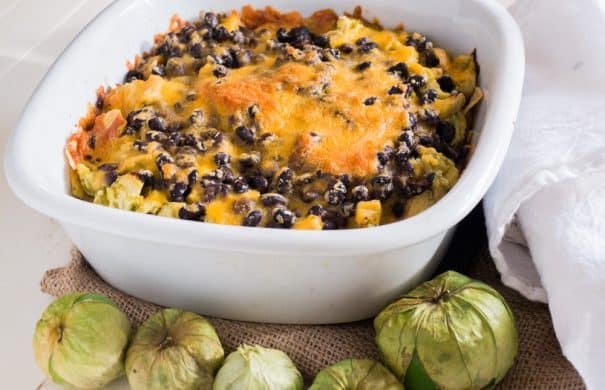 Casserole? Goodness, yes, please. 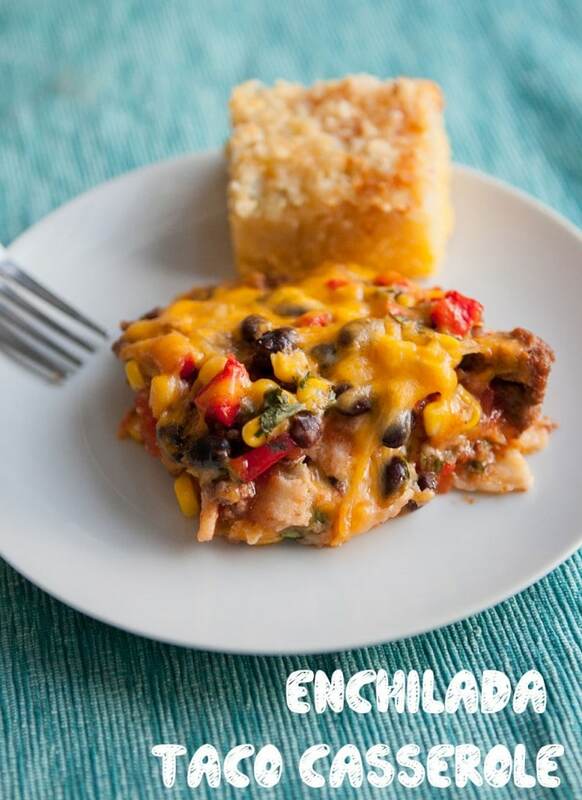 Say hi to Enchilada Taco Casserole! 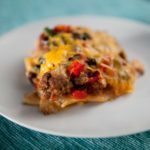 I really love this casserole because it stays set when serving, it almost feels like you are having taco lasagna. 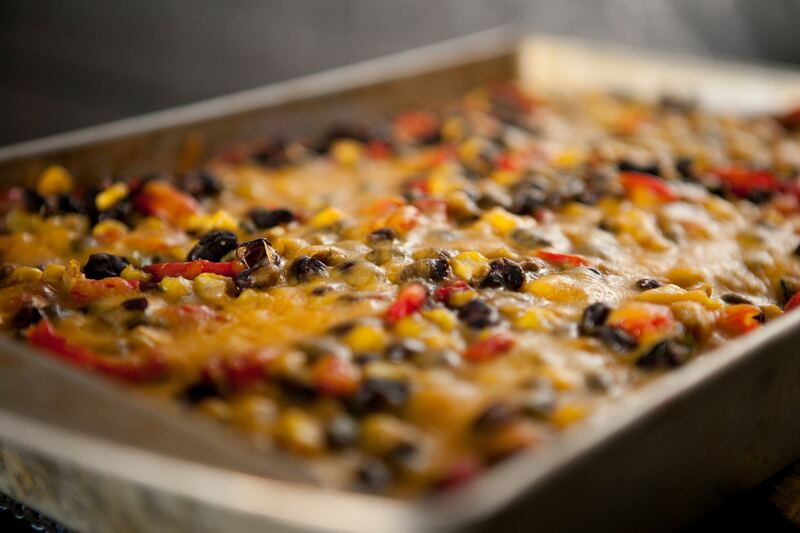 There’s 2 layers of corn tortillas, salsa, green peppers, black beans, corn and plenty of ooey gooey cheese to keep the cheese lovers happy (I’m in that club). 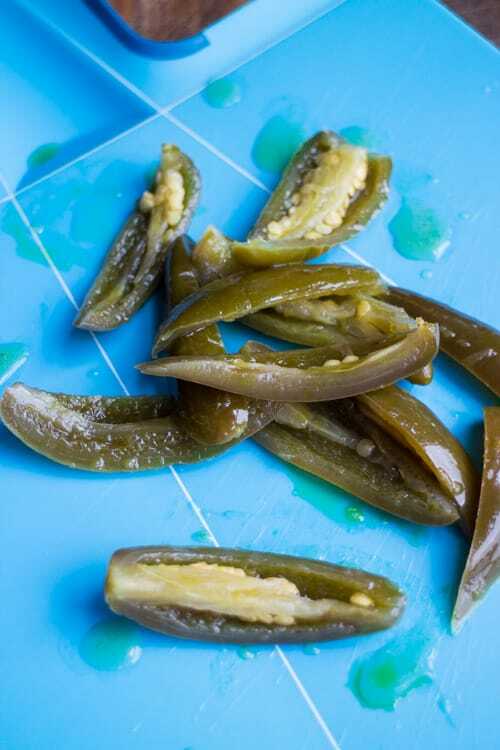 May I recommend some Jalapeno Cornbread on the side too? I could pretty much eat these vegetables with a spoon and that’s totally what I did when noone was looking. 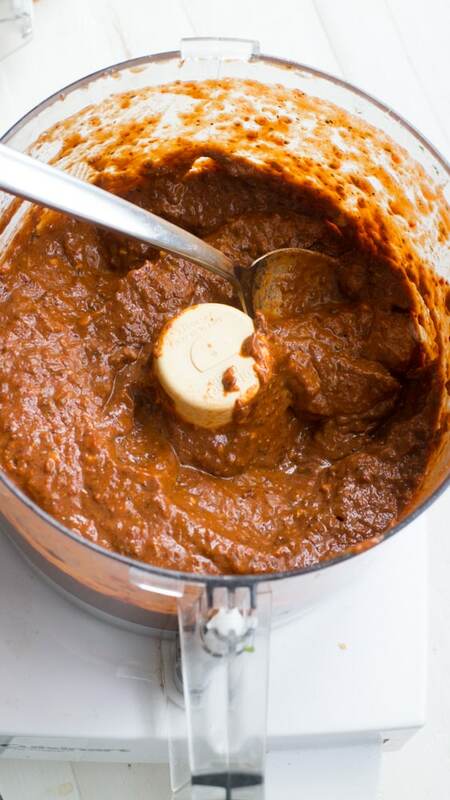 Here’s your ground beef, enchilada sauce and salsa. I could totally eat this with a spoon and that’s totally what I did when noone was looking. Essy approved of all the smells. 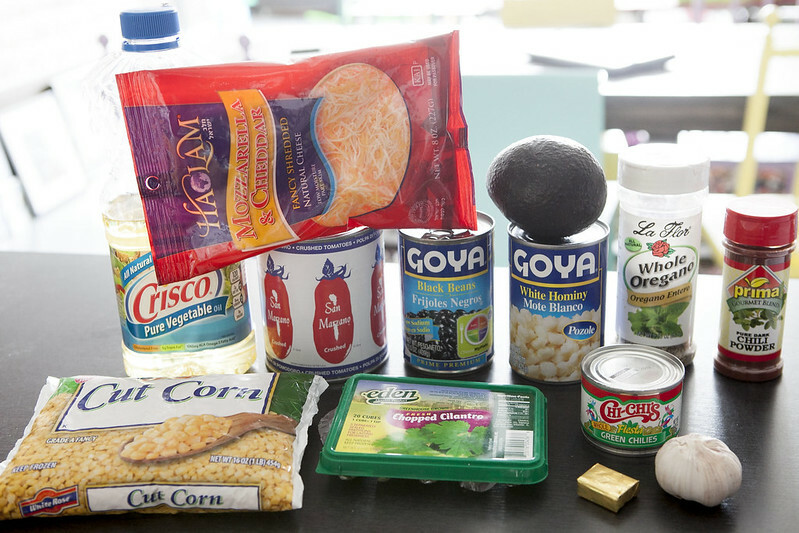 But honestly, what won’t Essy (AKA: “Big Mom”) eat? Here all the steps to make it. 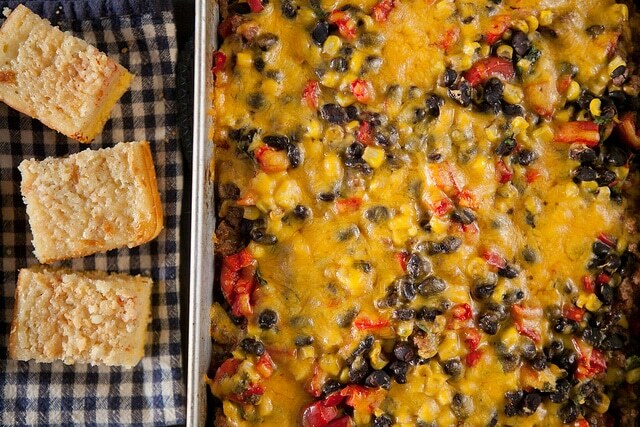 This is a quick casserole to put together. 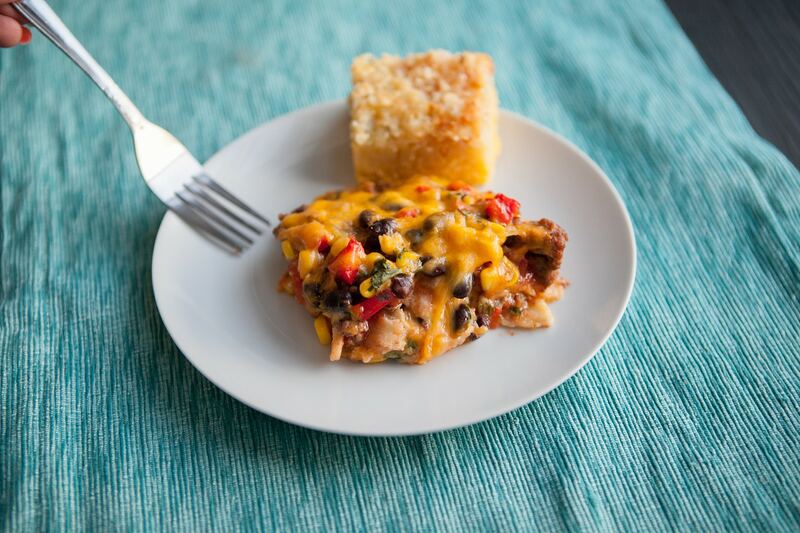 And when it comes out of the oven, hello cheesy Enchilada Taco Casserole! 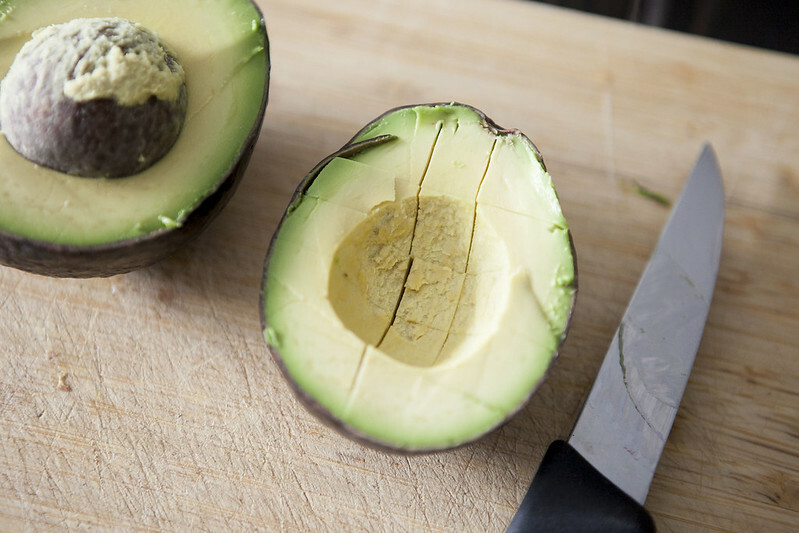 The smell will make you swoon. But don’t swoon because we have to eat this first. 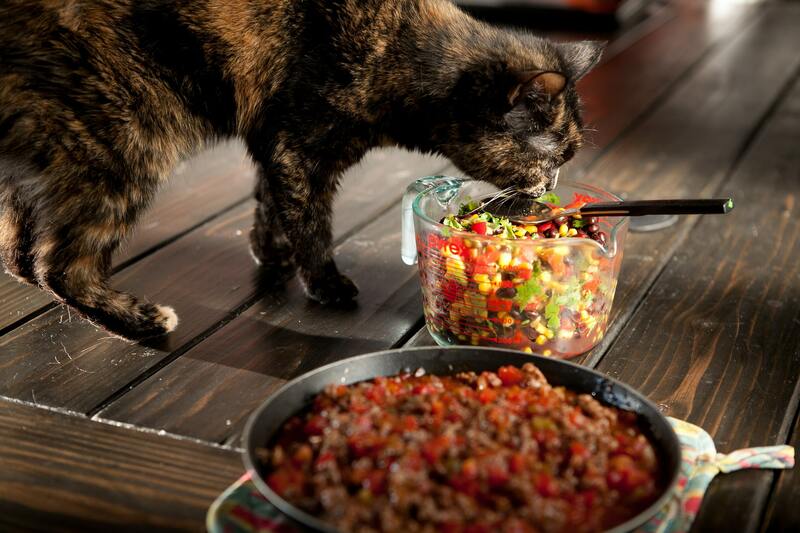 Oh please, put it on a plate already! I can’t wait anymore. I’m just going to sigh. 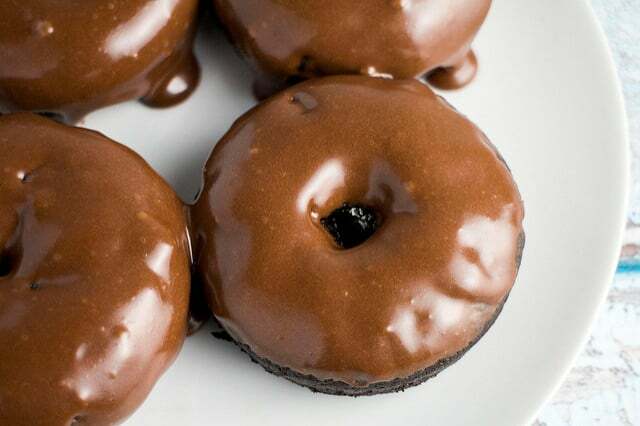 And then eat this and come back for seconds. 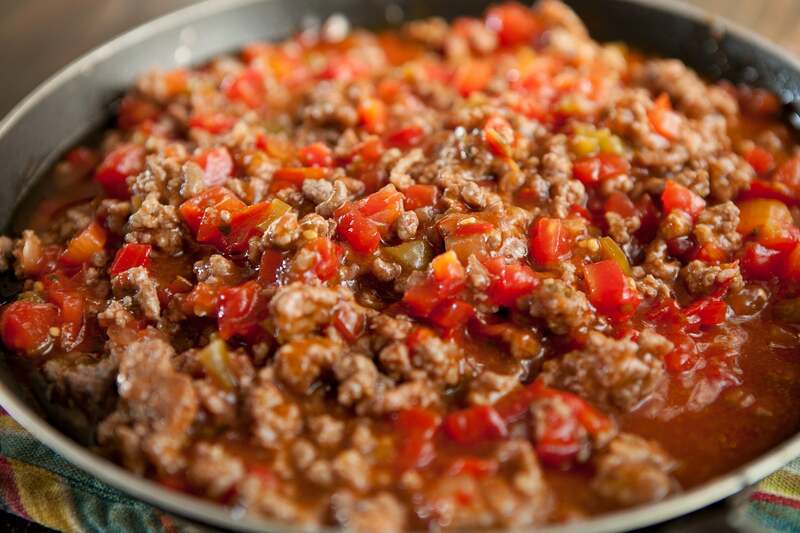 In a skillet, brown ground beef. 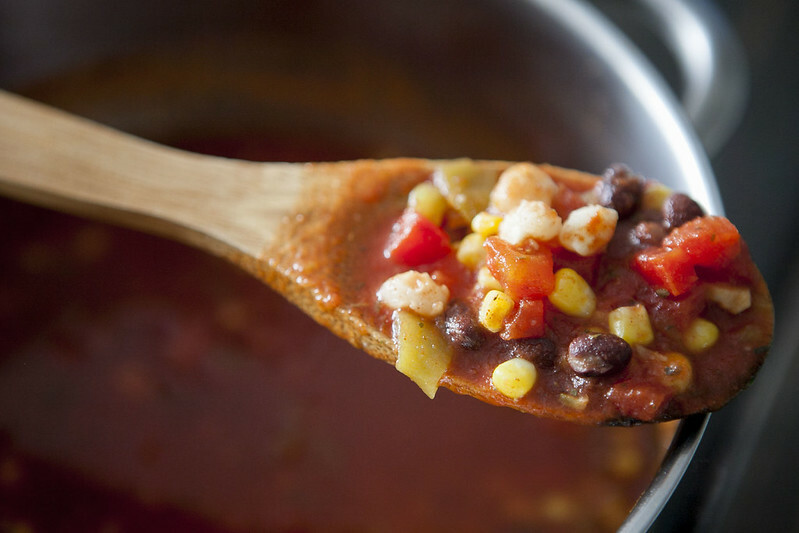 Stir in enchilada sauce and salsa. Set aside. 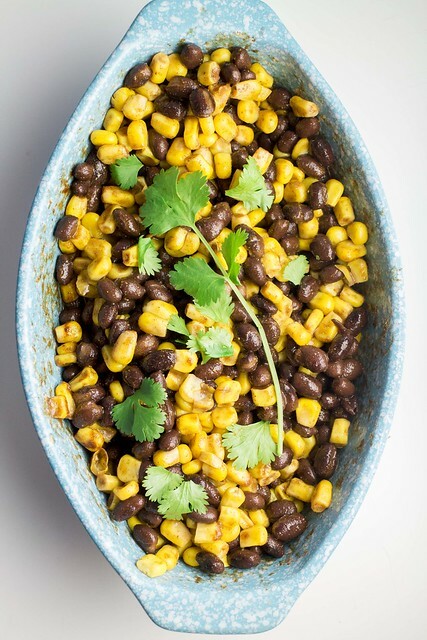 In a bowl combine your black beans, chopped pepper, corn and cilantro. 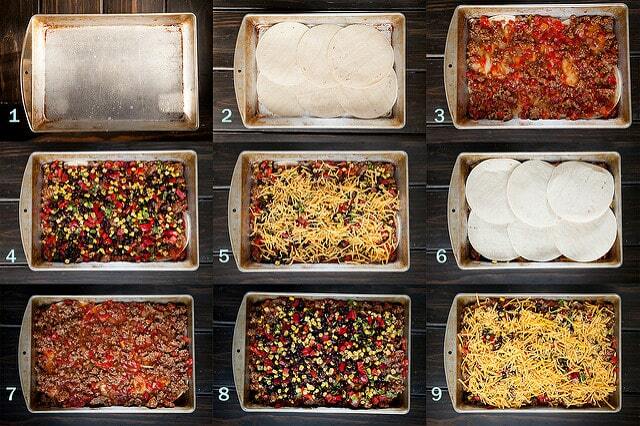 In a 13x9 baking pan place 6 tortillas. 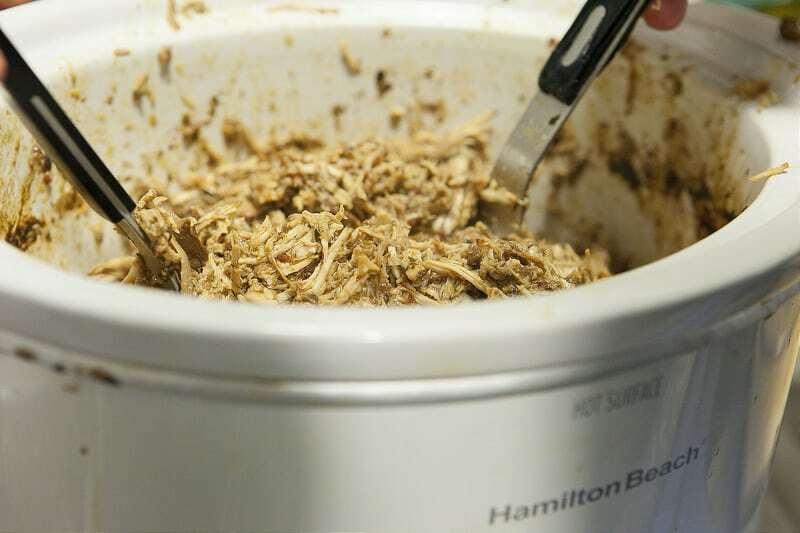 Cover with 1/2 of the meat mixture. 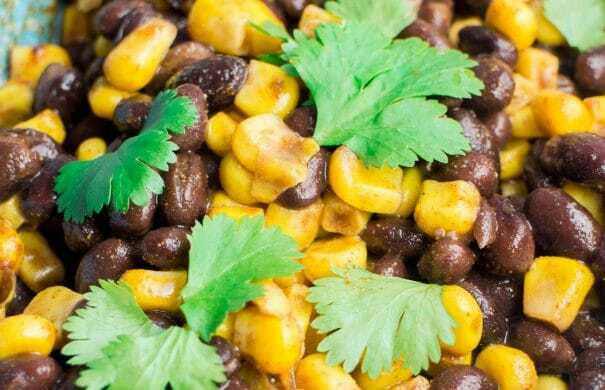 Cover with 1/2 of the corn, beans, pepper mixture. Sprinkle 1/2 of the cheese on top. 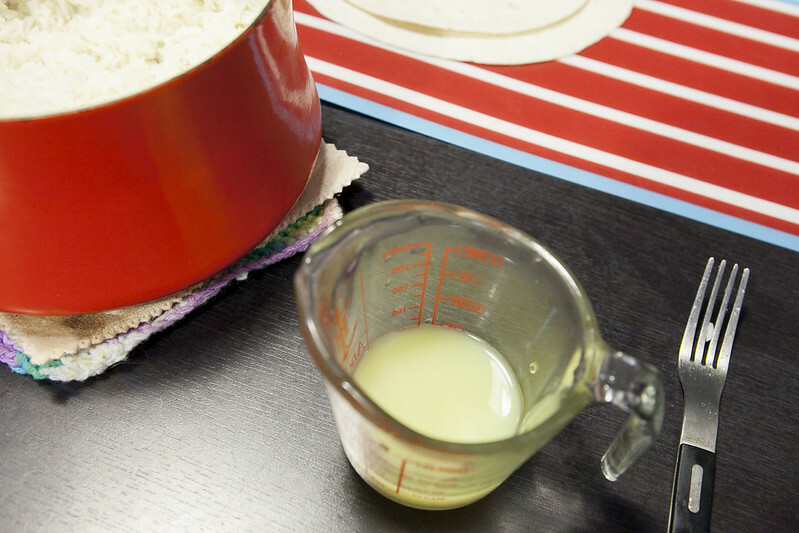 Place remaining 6 tortillas on top. 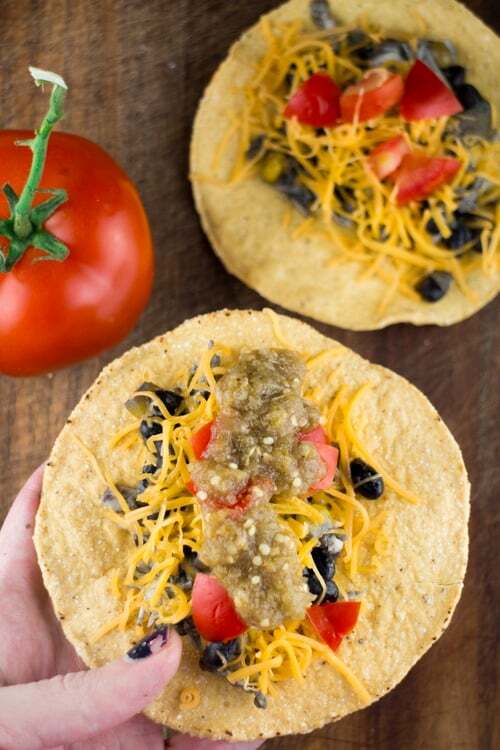 Sprinkle with 1/2 of the cheese on top.